The 72 reasons we had for visiting Vienna two summers in a row will never know – or care – that we returned just for them. When we finally saw them up close, the six dozen Lipizanner stallions of the Spanish Riding School were more interested in munching their muesili and hay than either the two of us or the other 30+ people on the School’s tour. Last summer’s rather poorly planned visit to Vienna ended in disappointment that we’d missed the famous Lipizzaner stallions – they were on their summer vacation back on the natal farm. Tough luck, we were told, but even the Lipizzaners need a vacation: they work hard. So, we planned a by-pass stop on this year’s northeasterly route into Eastern Europe and returned to Vienna, just to see the stallions. Michael calls this year’s 42-hour Viennese sojourn the Time of the Stallions: we attended the 3-hour morning practice session at the world-famous Spanish Riding School, then went on a 1 ½ hour tour of the stables later that afternoon. Disappointingly, it was strictly verboten to take photos of the horses, whether during their exercise session or at rest in their stalls. 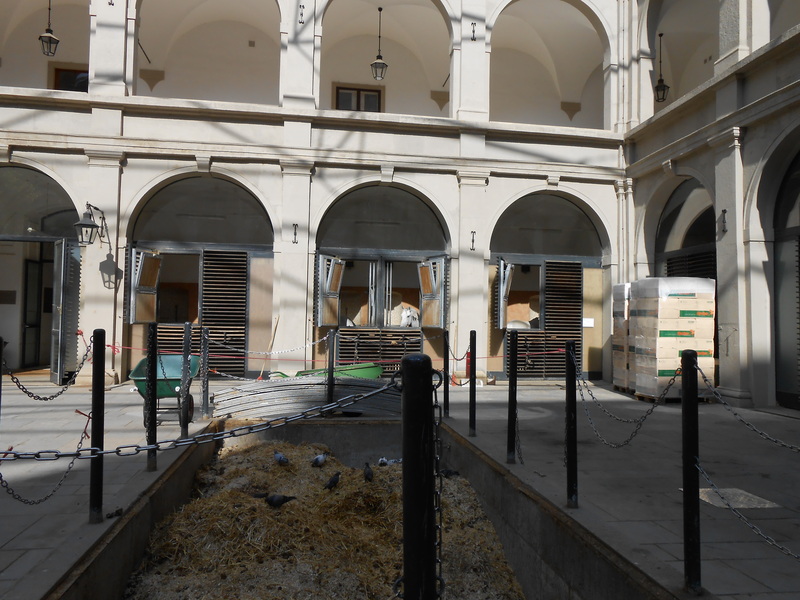 I suppose the Riding School wants to maintain its monopoly on the horses’ images: the cheapest DVD of the horses in the gift shop began at €29,50 – about $38 — and post cards started at about $3 apiece. Gewgaws of ceramic and crystal, astronomically high. But we were allowed to take as many photos as we wanted in the tack room (whooppeee!) and the (empty) Winter Riding School, which is why you will see so many of these pictures below. Also, with the exception of one illegally taken photo as noted below (I couldn’t resist), all the photos of the horses themselves I took from the internet. So many thanks to those generous people who post their photography on line for the public domain! How to be concise yet accurate? The origin of these horses, the Barb or Barbary horse, a mix of the Arabian horse and various Oriental breeds, is thought to be the north coast of Africa circa 800 CE. When Islamic armies invaded Spain, they brought with them the Barb, and over the centuries of Moorish rule, they bred their horses with Spanish stock, eventually producing the Andalusian horse, which itself has made significant contributions to many modern breeds, including the Thoroughbred. The Andalusian’s popularity grew among European royalty who valued these horses for their conformation, agility, stamina and stable disposition. Originally trained for military use, the horses found favoritism with European nobility in the increasingly popular art of fine riding and dressage. 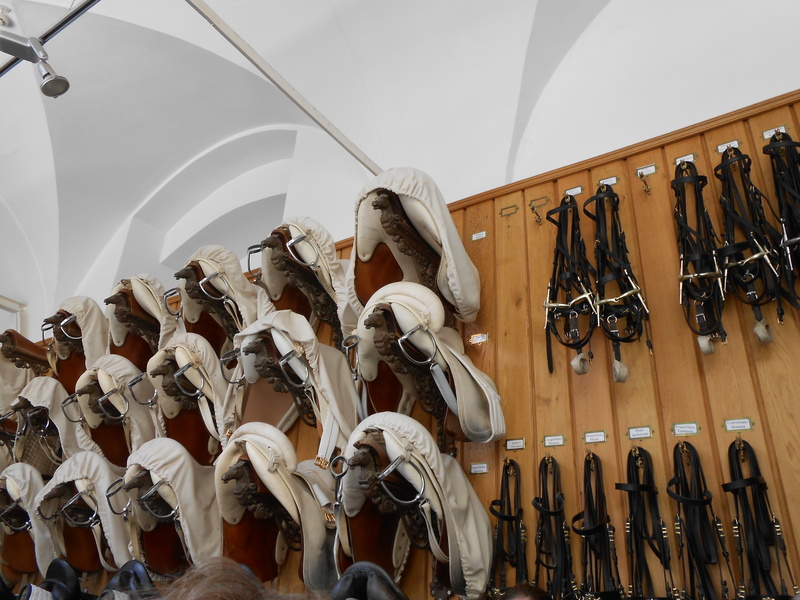 In the 1560s the Hapsburg Emperor brought several dozen horses to Vienna and began the Spanish Riding School. These horses became the forbears of the Lipizzaners you can see perform today. The techniques and movements the horses are taught are centuries old and based on martial maneuvers that riders taught the horses to sharpen their physical stamina and mental alertness. Our guide carefully dispelled the “myth” that the horses had been taught these maneuvers to use during combat. 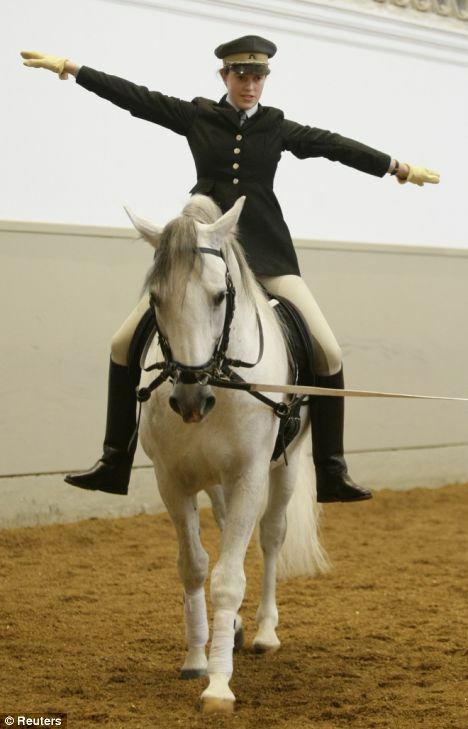 Over time, the discipline and series of techniques were refined and became known as dressage. Our guide during the tour emphasized that most of the behaviors, especially the most acrobatic and aggressive ones, were based on natural behaviors the stallions perform when attracting and protecting mares in their herd. The guide explained that only the stallions, as males, naturally perform these behaviors, so that is why only stallions and not mares or gelded males, are used by the school. The majority of foals are born black or a dark, dappled grey and become lighter with age. Most stallions reach full “white” (it’s technically “grey”) at about 8-13 years. Some horses are born bay, brown or chestnut and keep that color all their lives. Legend has it that having a bay stallion among the horses in Vienna is good luck, so there is always at least one bay stallion in residence. Currently there are two. The stallions begin their training at about the age of 5. Usually they are not ready to perform until about 12-13 years old. The horses will generally perform for another 10-15 years before being retired to the natal farm. Each stallion is trained and ridden by only one rider during its time at the School. Each rider has 5-8 horse for which s/he is responsible. 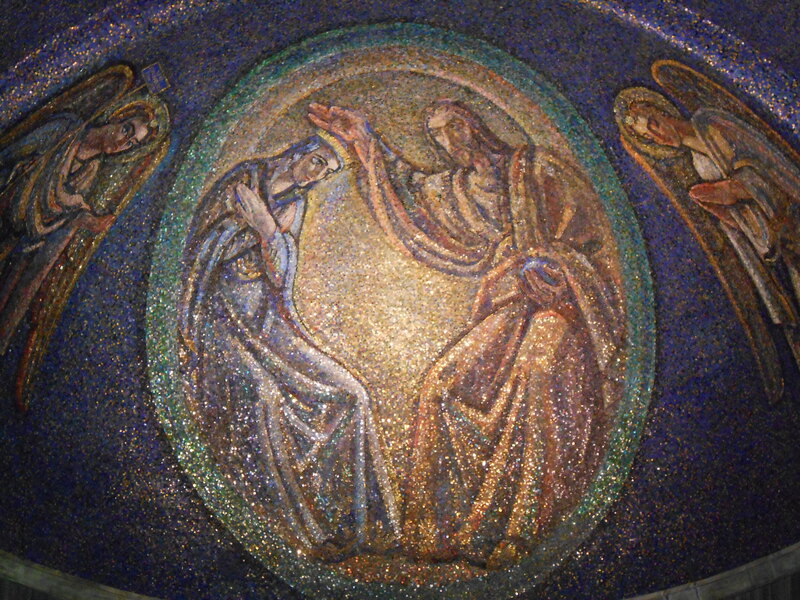 Women were not admitted to the School until 2008. There are four levels among the men and women at the riding School: Student Rider, Assistant Rider, Rider, Chief Rider. It usually takes 6-8 years for a Student Rider to advance to the next level as Assistant Rider. There is a very high dropout rate – 80% — among student riders during the first couple of years. However, many of those who make it to “Rider” or especially “Chief Rider” stay at the school for much of their adult life. The oldest there today, the most senior Chief Rider, is 72, still performing, with no intention of retiring. A young Student learning to ride. 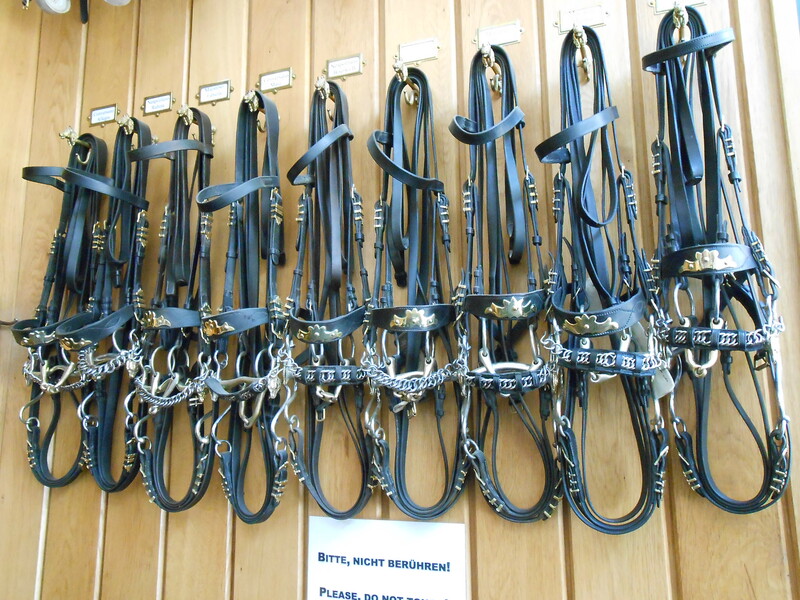 A row of bridles used in more advanced training. Te performance bridles would be replete with gold plate. 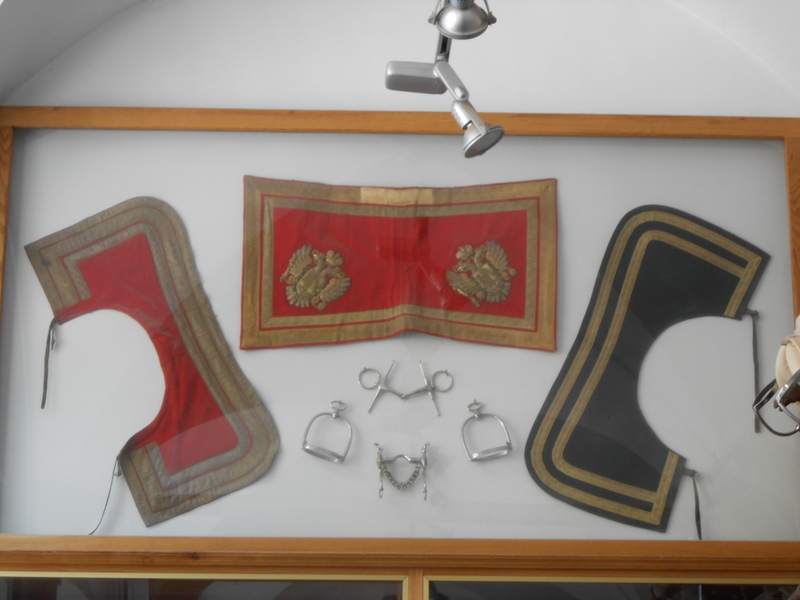 Cloth-covered performance saddles with training bridles (snaffle bit) to the right. A halter, with no bit, is used in the first stage of a young horse’s training. A simple snaffle bit and single reins are used as a horse begins to perform slightly more advanced movements and passages. A more senior horse will have the double reins and curb bit. 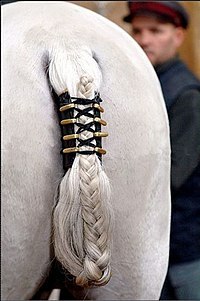 In performances, the horse will wear the gold-plated, double-reined bridles. In addition to the special bridles and saddles, the performance horses will be decked out with gold-plated breast plates and specially colored saddle cloths to denote its aerial abilities. 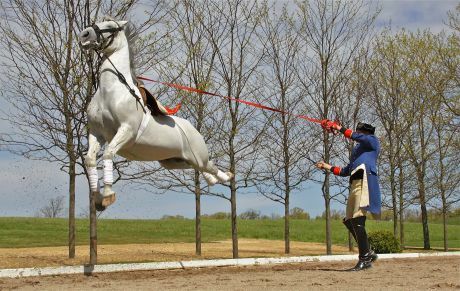 The green cloth indicates the horse can perform all the “Airs Above Ground”; a red saddle cloth indicates it can perform all the required movements except aerials. The number of gold bars on the saddle cloths (and the rider’s bicorne cap) denote the status of the rider: 3 gold bars with a fringe is the Director of the school, or Chief among the chief riders; 3 bars and no fringe is a chief rider; two bars for a rider, and one for an assistant rider. Students literally have to earn their gold bars. The color of the saddle cloth and the number of gold bands or bars denote the horse’s level of ability. Of the three “Airs Above Ground” the School and its stallions are most famous for, the capriole is considered the most difficult. The horse will begin with the intermediary croupade, in which he leaps straight up off the ground, rear legs tucked underneath, and its entire body must remain parallel to the ground. However, in the second stage of the capriole the horse then extends its legs back and must remain elevated and parallel to the ground to perform the maneuver correctly. It takes an amazing amount of strength and agility for a horse to perform this maneuver. Interestingly, it does have its basis in natural behaviors; stallions will often kick back with one or both feet to warn off or thwart potential rivals or protect his mares. The Capriole, both with rider and in training. 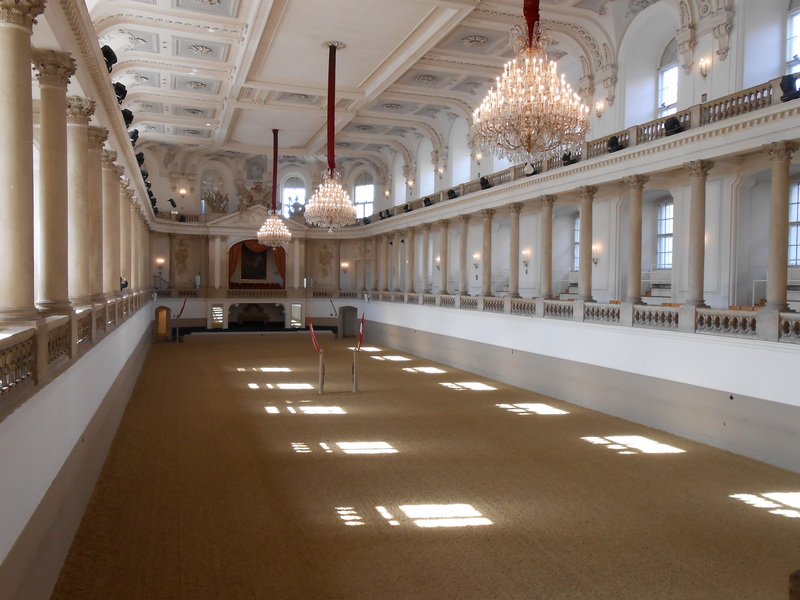 The Winter Riding School, the indoor arena where the morning practice sessions are held as well as the performances. In keeping with our intent to try and see new sights as we travel this year, we visited the Freud Museum in Vienna as well as the Spanish Riding School. The museum is housed in the apartment where Sigmund Freud lived and worked for nearly 20 years before friends and family finally convinced him to flee the Nazis in 1938. He died a little over a year later in London. Some of the rooms contained memorabilia, especially interesting if you’re a fan of or at least knowledgeable about Freud’s life. Others had less information. The most interesting was the “Media Room” which had monitors running loops of film reels of home movies taken of Signmund Freud among close friends and family. Not only were the films fascinating, but Freud’s daughter, Anna, provided an explanatory narration of the events which was highly informative. I can’t resist posting a few more pictures. The weather was much nicer than last year, so I was snapping like mad. 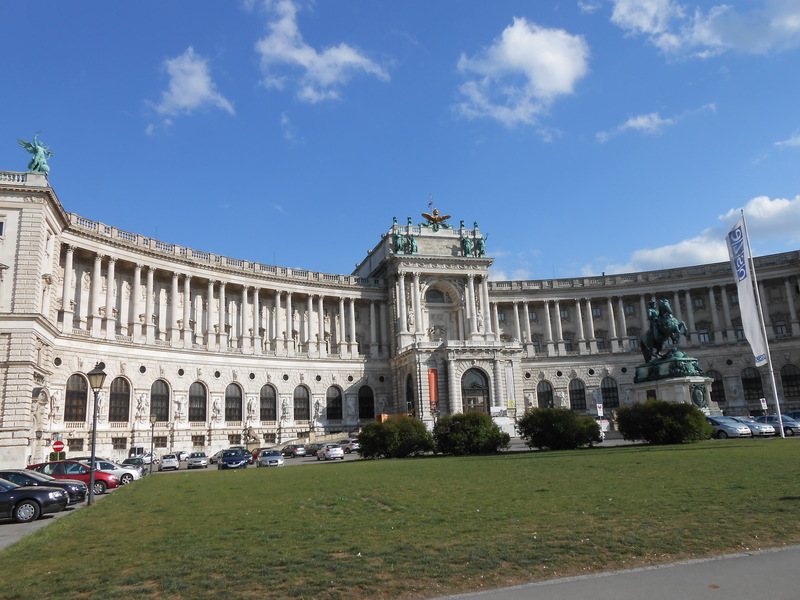 Below are some of my favorites places in Vienna, and I’ll just end here. Buon viaggio, happy trails, and all that jazz! 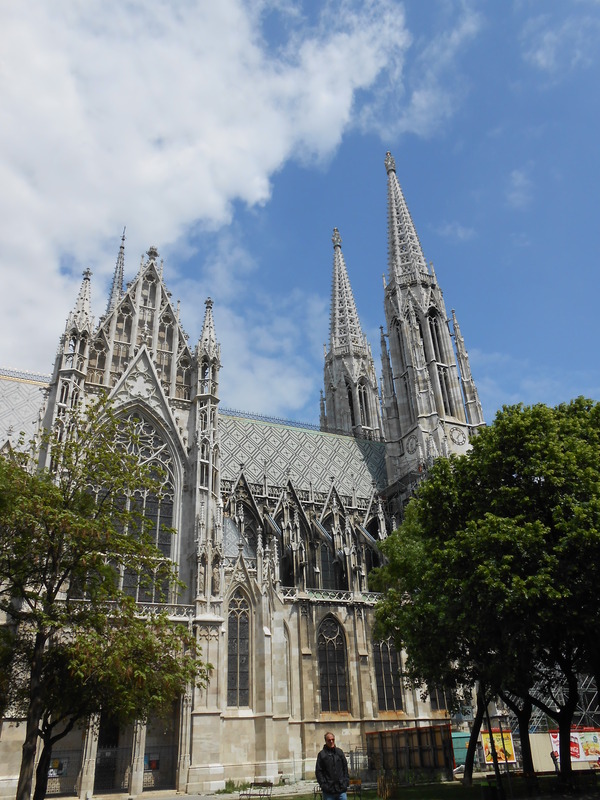 The Votive Church, one of my favorites in Europe; I love Gothic architecture! Surprisingly, there is a near-exact replica in Helena, Montana. 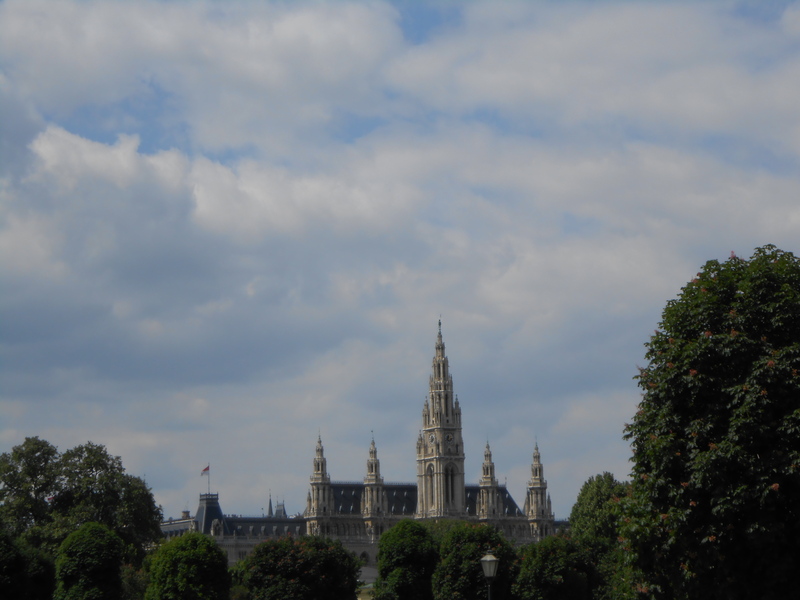 Vienna’s Rathaus or town hall. My one (illegal) photo of a Lipizanner stallion in one of the exterior stalls. Note the huge underground manure pit in the foreground. Each horse’s stall is cleaned out once an hour. That’s a lot of straw and manure! Hope you enjoyed this posting! 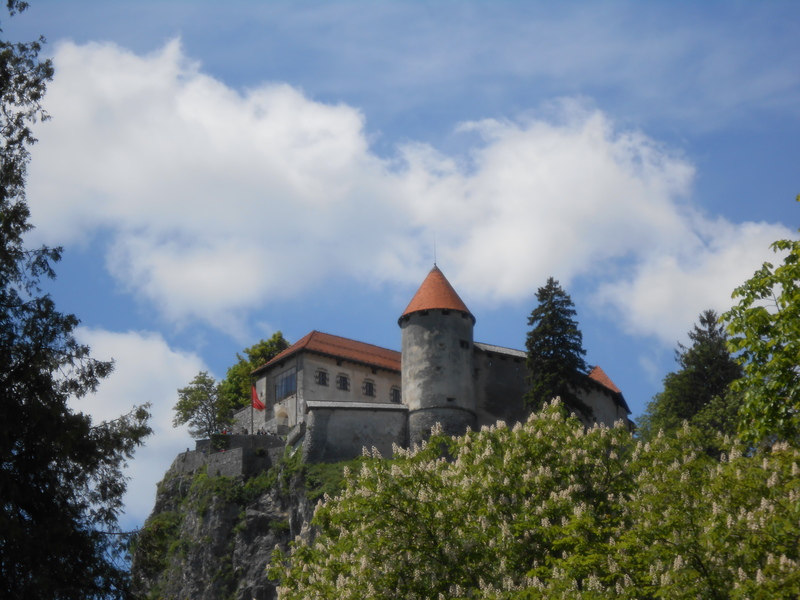 Above: Bled Castle overlooks the small town of Bled, framed by the Julian Alps. A blue-green glacial lake, austere castle towering above, one sole islet with a picturesque church perched on top – this is Bled. But bring your walking shoes if you want the best views. From the 6.5 kilometer perimeter lake stroll to 250 stairs to an observation point to the 125 meter hike up to the castle — and don’t forget the 99 steps on Bled Island — this town is made for walking, and a lot of it is near-vertical. Yet we’ve been to very few places where the setting has such fairy-tale beauty. 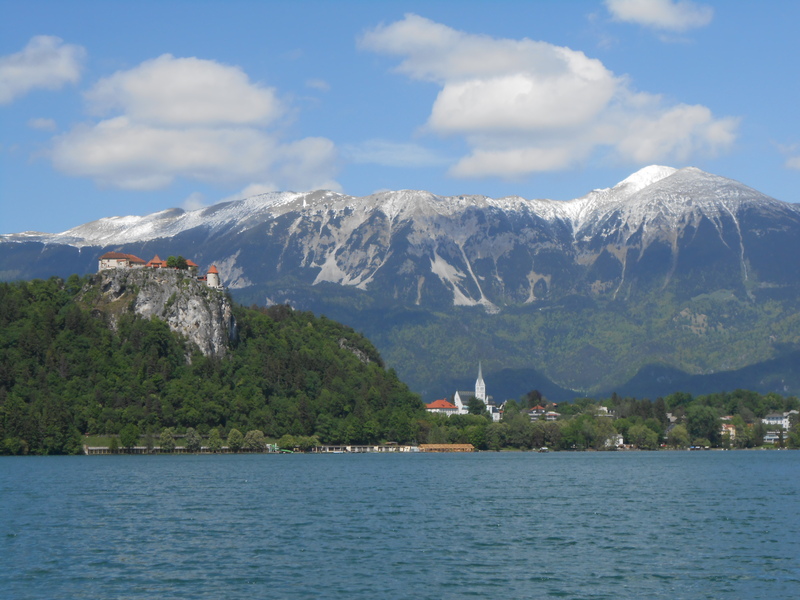 Bled is a small town that can trace its origins to the Stone Age. On the fringe of Roman rule, the town wasn’t mentioned in written history until 1004, the castle in 1011, although excavations indicate that a castle or fortification had existed on this rocky promontory for some centuries previously. 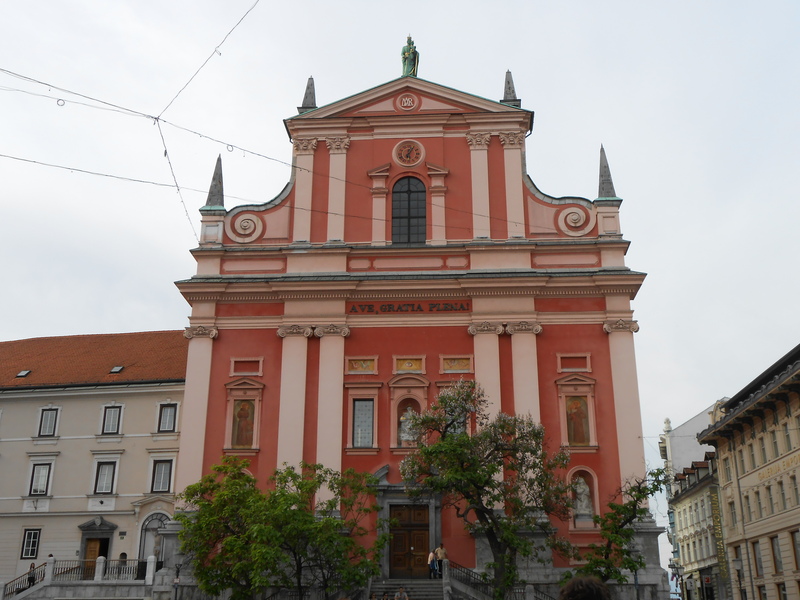 It is directly accessible by train, bus or car (we took the bus from Ljubljana). 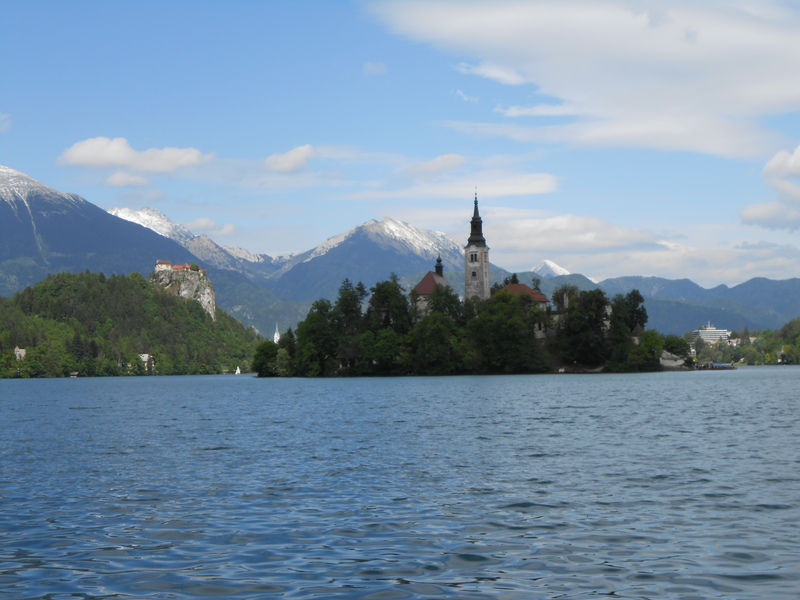 Located in the Julian Alps of northwest Slovenia, Bled has been a favorite vacation spot for Slovenians and (former) Yugoslavs, and other Europeans in the know for a couple of centuries. 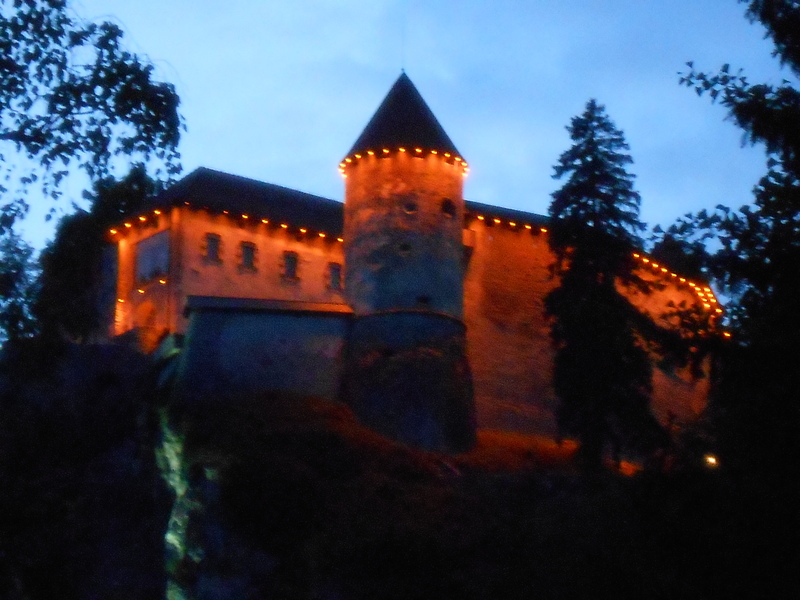 Today, Bled is gaining rapidly in international tourism. 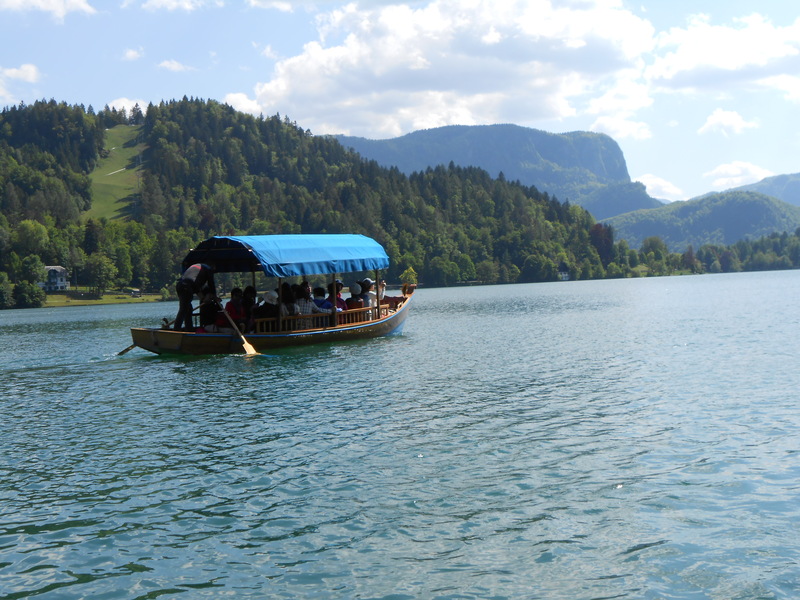 Just in the two days we were there we saw two large Japanese and Korean tour groups as well as assorted European couples and families; we shared a gondola out to Bled Island with a blend of couples from Austria, Belgium and Singapore. One view of Bled Island from the lake perimeter. 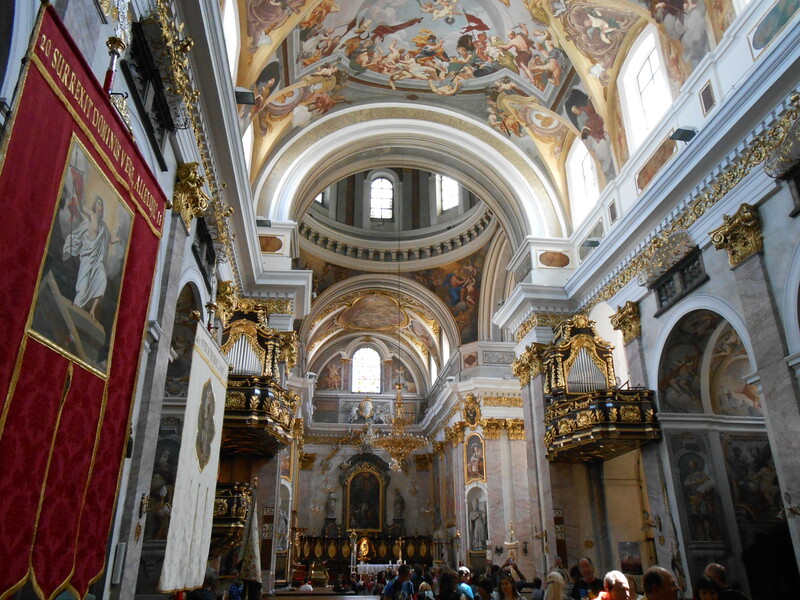 The Church of the Assumption, dating back over a 1,000 years, perches atop. Our first day in Bled we walked around the lake, an easy stroll with so any scenic vistas I was glad we were in the age of digital photography. In any other era I would have run through a month’s supply of film canisters in the first hour. The second day we hiked up to the castle, then relaxed over lunch on the parapets before descending. 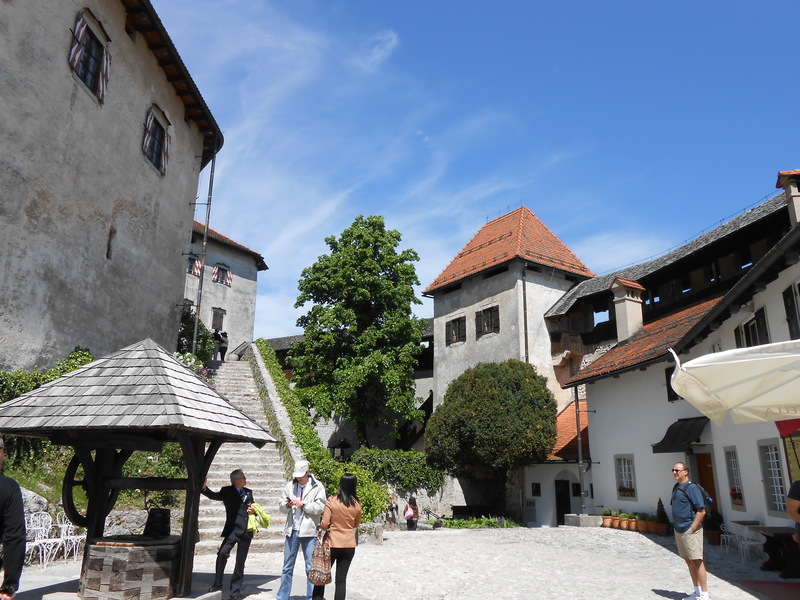 The castle contains a small historical museum and interesting, a small exhibit on the history of printing in Slovenia, souvenir shops, herbal museum, and restaurant. The upper courtyard at the castle. The lower and older courtyard; Michael’s posing at bottom right. 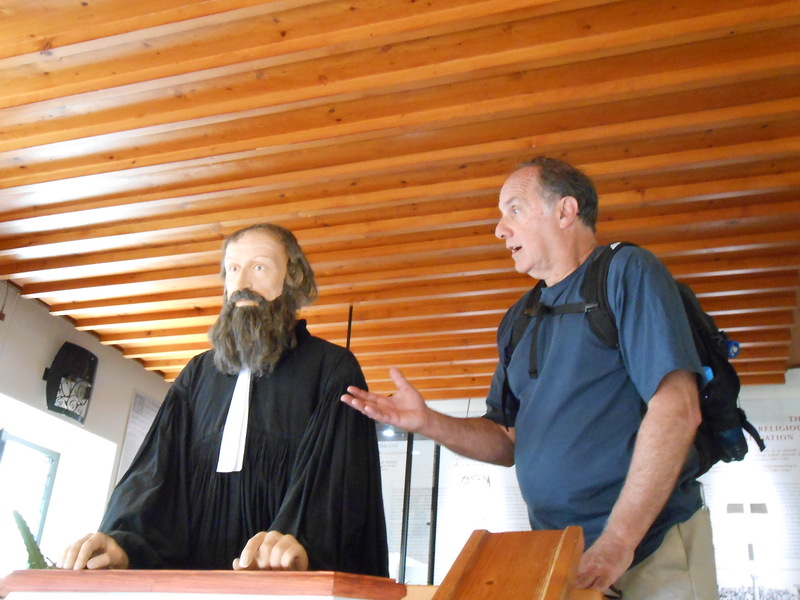 Michael arguing a point of theological theory with a 16th century minister. Slovenia had embraced the Protestant Reformation in its early years, producing several of the first printed Protestant Bibles in the Slovenian language. Their protest was short-lived, as ruling popes sent in the Jesuits to whip (or burn) the rebels into shape. 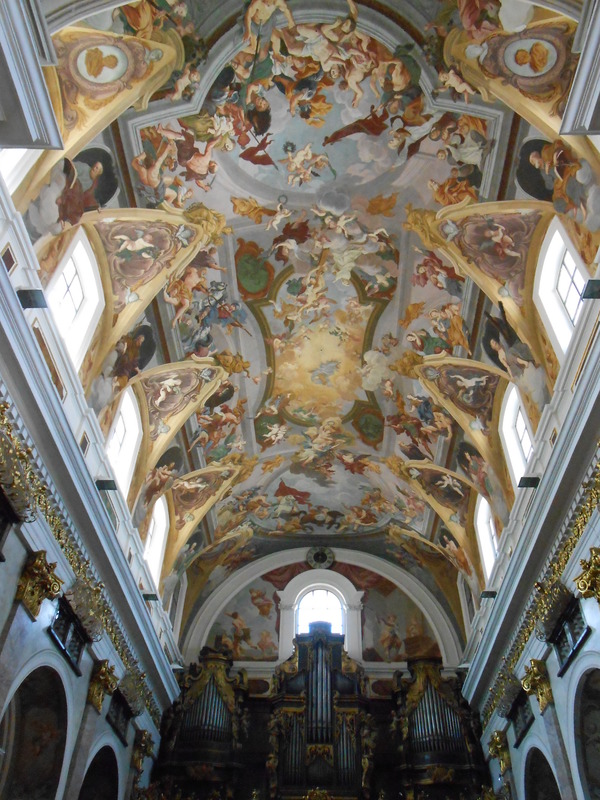 Slovenia since the beginning of the 17th century has remained Roman Catholic. At last, the view from the castle. What a climb up the rocky face to the castle! Later that afternoon we opted to take a “gondola” out to the island rather than rent a row boat, which is how we found ourselves in a multi-national vessel. 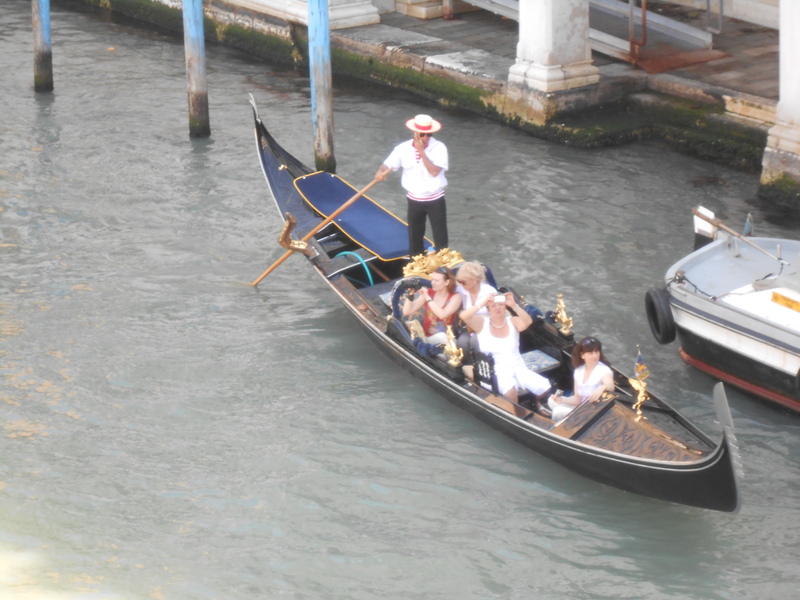 The “gondolas” are not at all like their Venetian counterparts. They are much larger, holding as many as 20-24 passengers, yet usually have only one “gondolier” who wields two large oars to propel his boat through the waters. Needless to say, the gondoliers are very muscular. Once on the island, the boatman allows 30 minutes to explore the miniscule island, which is ample enough time; it’s a tiny island. I opted to pay the €3 to enter the church of the Assumption of the Virgin Mary, and discovered the name was almost bigger than the facility. But what it lacked in interesting artifacts and size was made up for by gilt. A lot of gilt. Not quite my thing. I spotted a rope dangling in the apse, and noted it seemed to go up into the tall bell spire. A nebulous sign in hieroglyphics seemed to indicate that it was okay to ring the bell as long as you didn’t hang on the rope and pulled only three times. So I did. Nothing happened. I pulled three more times – hard. Still nothing. I waited a few beats, then pulled three more times, and the bells started ringing and clanging like a five-alarm fire. They were enormously, unbelievably loud and they would not stop. Sure the church’s bell police were going to rush in and truss me up and cause an international incident, I scurried out of the church, bells still clamoring away. I’d lost count of the number of ear-splitting peals at this point. The ticket taker didn’t even look up from her book. But it was worth it. I’d never rung church bells before. 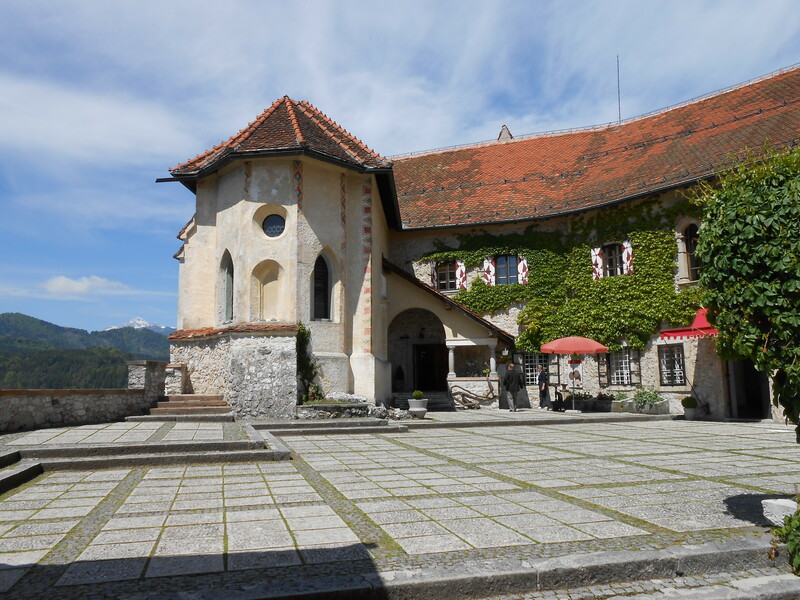 It should be no surprise that quite a lot of Slovenian couples choose to be married in such a lovely location. What is surprising is how many actually survive their wedding day. Local legend has it that once married, the groom carries his bride up the 99 steps to the church. If they make it to the top, they will have a long and happy marriage. Needless to say, I took one look at the steps and wondered how many grooms made it to the top…and what percentage collapsed in a heap. 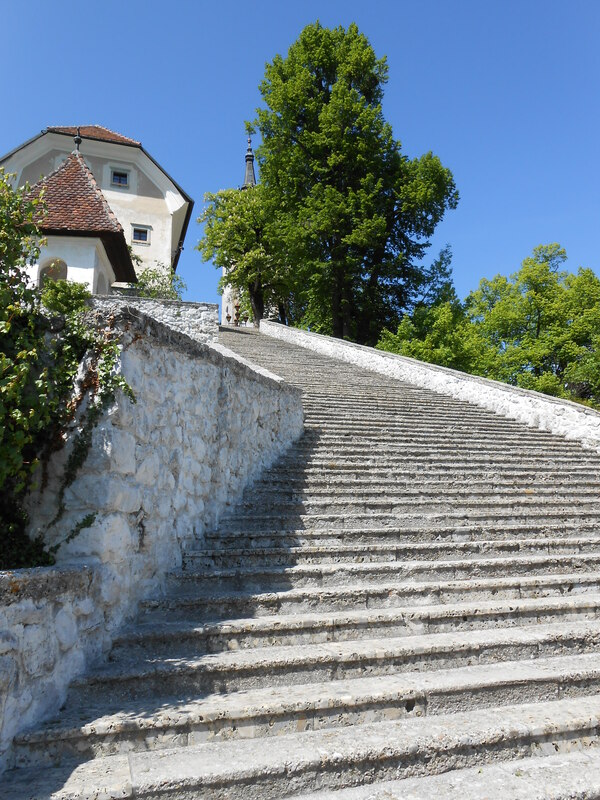 The 99 steps leading to the church on Bled Island: a groom-killer of a staircase! On our return boat ride, we momentarily faced a potential international incident. One of our gondola group, a boisterously gregarious Belgian, spotted a heavily laden gondola full of Asians heading to the island. Full of jingoistic mischief, the Belgian hollered out in English to them, “Welcome to China!” There was a moment of stunned silence in both boats, then in unison the other group hollered back good-naturedly, “Korea! !” We all got a solid laugh out of that. I was just relieved the Koreans had a really good sense of humor! 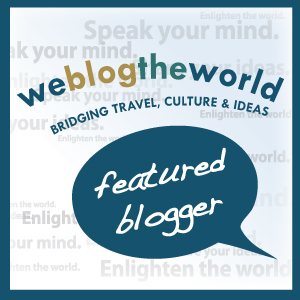 A slow boat to China…no, Korea! 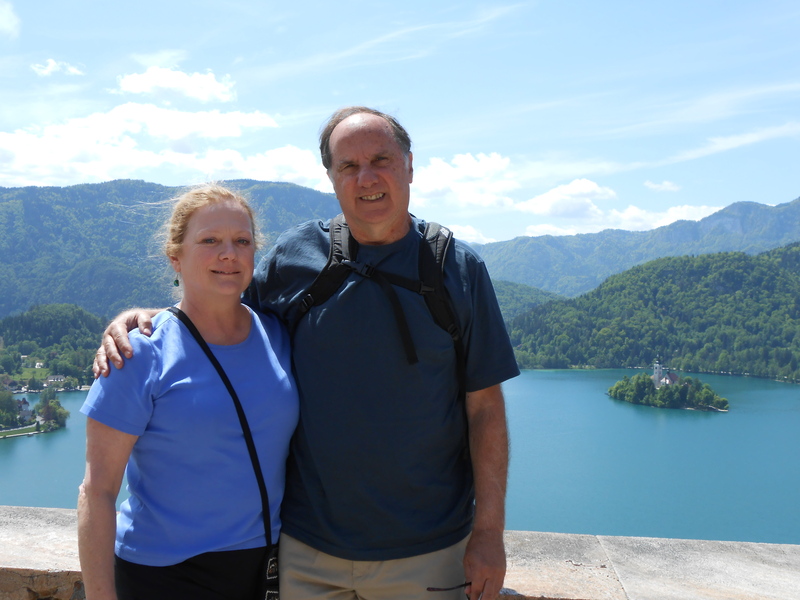 In all, Bled was a fabulous respite from our travels. I’ll end this posting with just a few comments about our hotel, the Vila Preseren. This former vacation villa is small, consisting of six small rooms and two suites. The bedrooms and en suite bathrooms were small but comfortable, and we got good rates on line. The place is mostly known for its restaurant, which purportedly serves the best cuisine in Bled. Since we ate only at Vila Preseren, we have no basis for comparison, but the food and service were excellent, and the menu varied. Supposedly the Vila Bled, the former summer residence of Yugoslav President Josef Tito and the other “luxury” hotel in town, also has excellent cuisine, and far more rooms, but we did not try it for dinner as we were happy with the Vila Preseren. The town of Bled is small, but it does have a range of accommodations, both in the town and outside, if you want to take a local bus. I was told the Best Western was a comfortable hotel, but did not check it out. Ljublana” means “beloved” in Slovene, and just a few hours here proved why. The old town, charming and compact, is bisected by the Ljubljanica River, whose banks are lined with modern cafés and whose girth is spanned by bridges both quaint and unique. Narrow, cobbled, pedestrian-only streets wind their way through a succession of small squares and markets. Above the old city looms the Castle Hill, a reminder of bygone eras and attempted conquests. 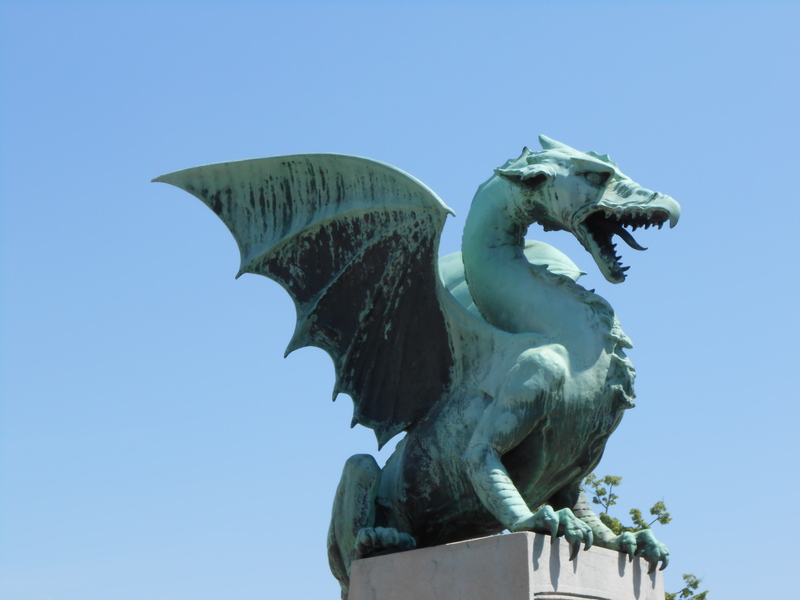 The green and white Ljubljana flag, fluttering from the watchtower, is emblazoned with a pictograph of the castle and the city’s mascot, a green dragon atop the battlements. With sunset, the town took on a dusky glow before lights twinkled on both sides of the river. 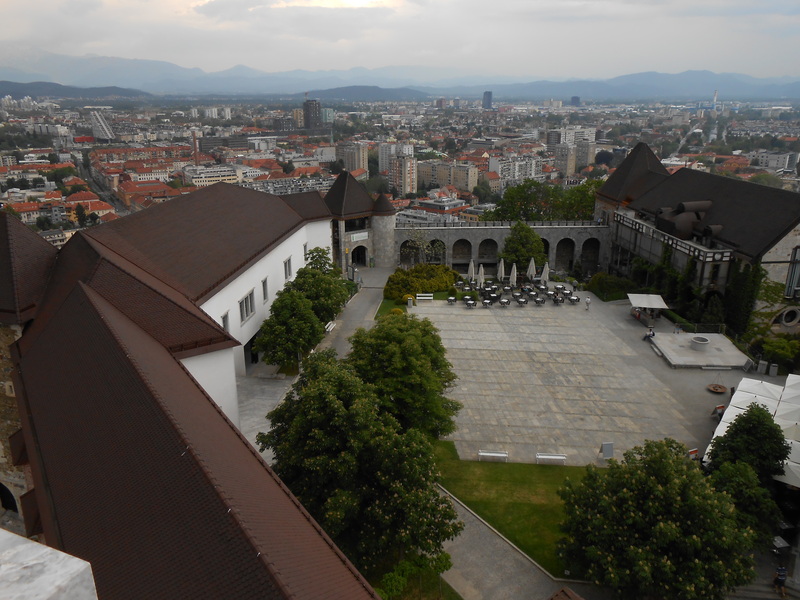 Ljubljana Castle, overlooking the old city. Most non-Slovenians over the age of 40 will remember a country called Yugoslavia, which came into being at the end of WWI as a coalescence of former Balkan countries and remnants of the Hapsburg Empire. As (hopefully) most people know, the union of Yugoslavia slowly disintegrated after its president-dictator, Josef Tito, died in 1980, when sectarian differences among the multiple ethnic groups began to chafe at the national fabric. As communism lost its totalitarian glue throughout Eastern Europe, so went the former Yugoslavia. Slovenia was one of the first to declare its independence, which should not have been much of a surprise to the largely Serb-dominated Yugoslavia. During our five days in Slovenia, more than one person provided an impromptu history of the country that started with: “We’re Slavic in origin, but not really like the rest of the Slavs in the south,” with an accompanying shrug and dismissive gesture in a southerly direction. “We’re actually more European and always have been.” Then the kicker, nearly verbatim (propaganda anyone? ): “Slovenia accounted for over 20% of the economy of Yugoslavia, and we were tired of paying for everyone else, so” (another shrug), “we separated.” Okay, this is a capsule history, so I won’t bore you with endless details. Suffice to say that from about 1990 until very, very recently, much of the former Yugoslavia has been engulfed in sectarian warfare accompanied by targeted genocide among most of the fractious ethnic groups, the extended Bosnian-Serbian-Croatian conflict being the most infamous. Today, Slovenes are justly proud of their accomplishments even while noting with self-deprecation that they are a very small country on the world stage. 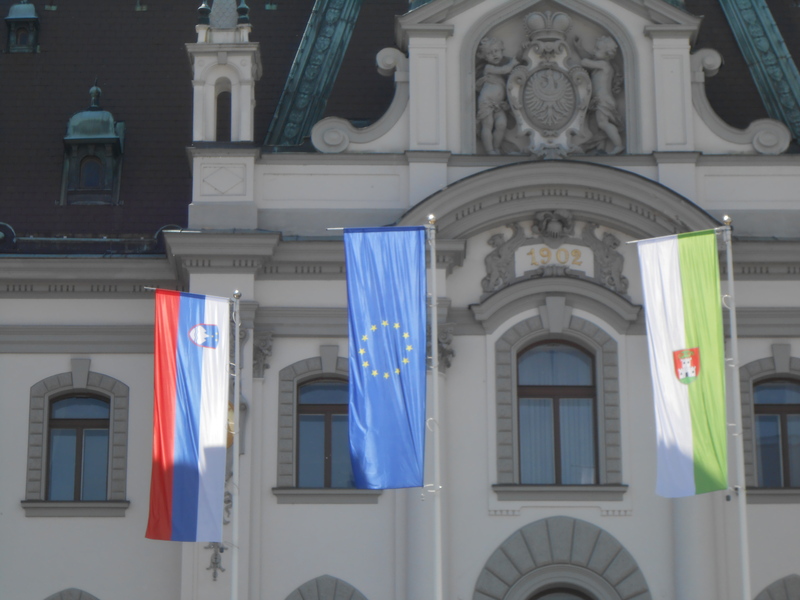 With a total population of 2 million, and approximately 270,000 in the capital, Ljubljana, the country is small, but very stable, democratic, with a growing economy and is a proud member of the European Union. Slovenia is also one of the greenest countries in Europe with 60% of its land covered with forests. 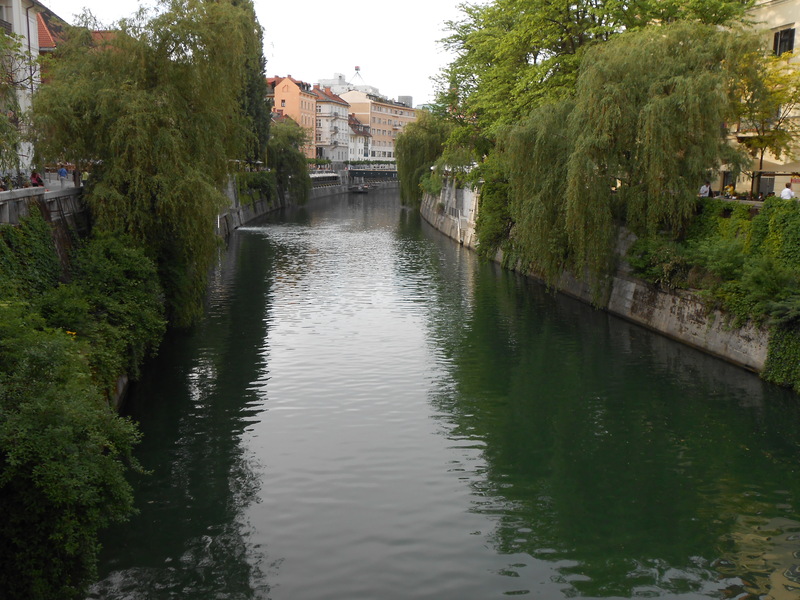 The heart of old Ljubljana straddles the river, with Presernov Square on the north bank and the city market and a series of smaller squares on the south bank. 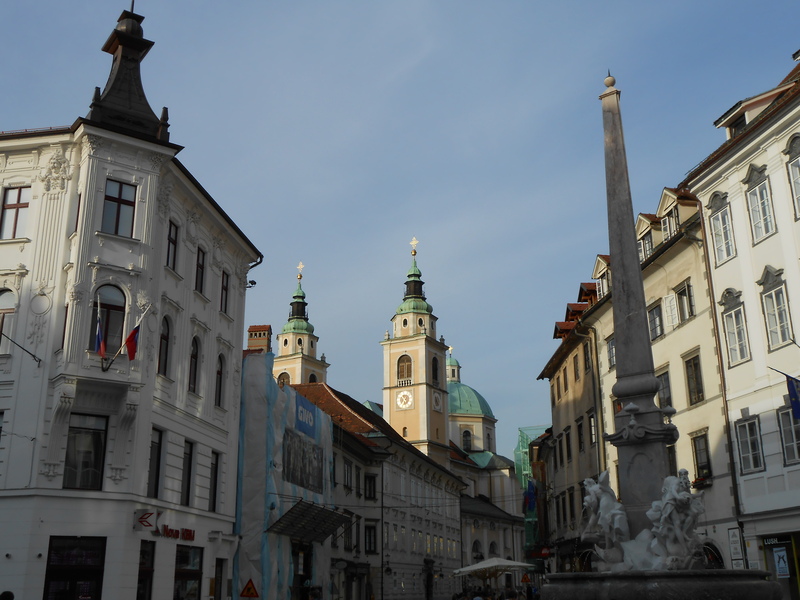 The square is named after France Preseren, the national poet of Slovenia, who lived and wrote romantic poetry in the first half of the 19th century. Virtually all of Slovenian literature tips its collective hat to him. Several pedestrian bridges span the river, each with its unique style and history. 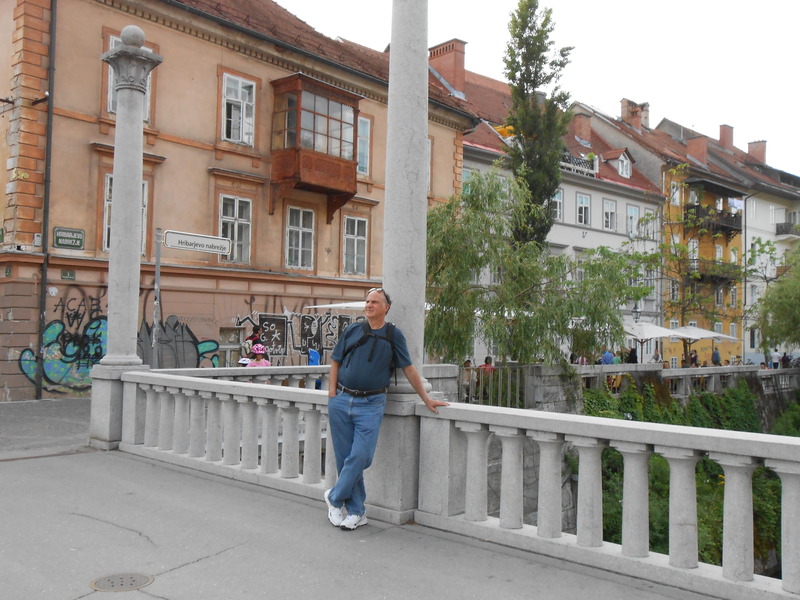 Michael on the Triple Bridge, which spans the river from Presernov Square, the heart of Ljubljana, to the old town. The middle bridge dates to medieval times and was expanded harmoniously to include two pedestrian spans before all three were made pedestrian-only. In the midst of Old Town, the more modern-day Butchers’ Bridge arches over the river to the heart of the huge market square, right next to — of course! — the pavilion housing the butchers’ stalls. 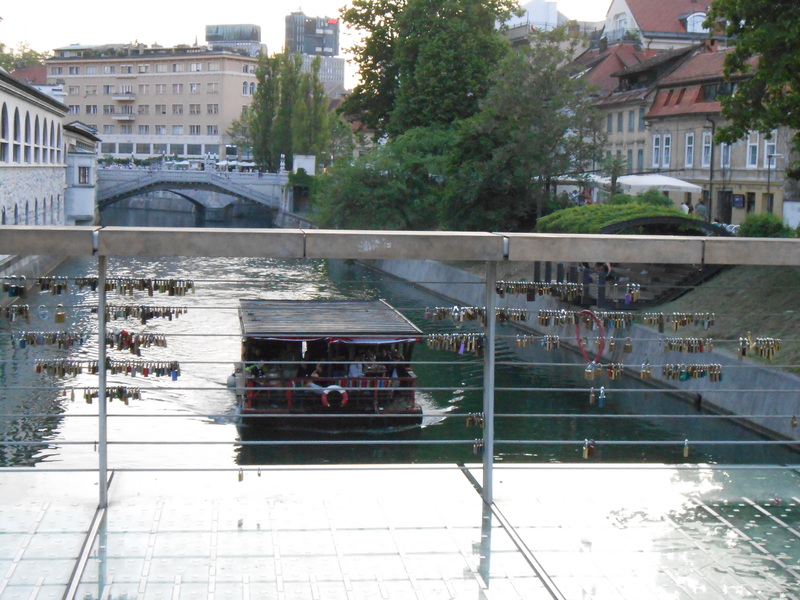 In recent years, lovers have begun to secure locks to the bridge as a symbol of enduring love. 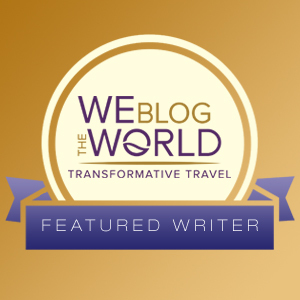 This trend has caught on in several other European capitals, including Prague, where we first saw this phenomenon, as well as Wroclaw, where we will be going as well. 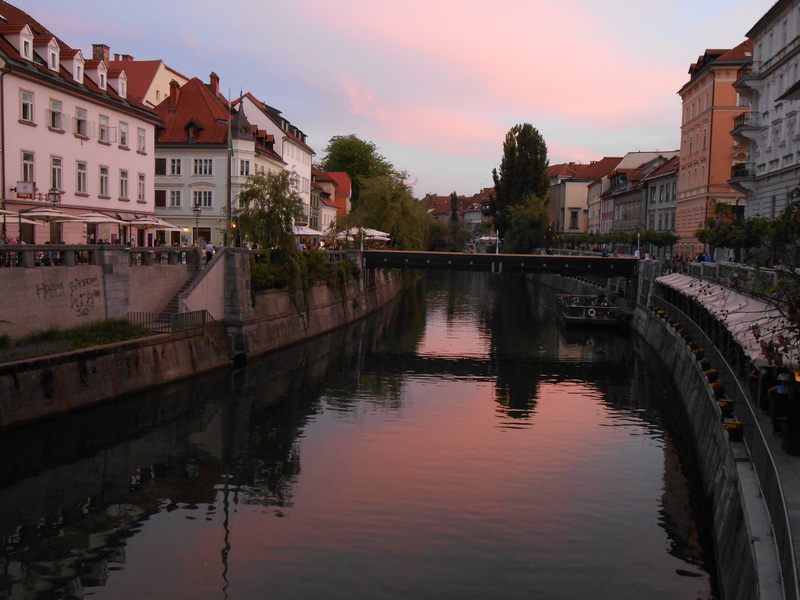 We took a 2 hour walking tour of Ljubljana, which we highly recommend. The guides do not charge a fee, but work solely for tips. (If interested, go to http://www.ljubljanafreetour.com/.) Along the way we trekked cobblestoned streets, learned a fair amount of Slovenian history, sampled sour cabbage and sour turnip, both of which were much better than expected, and gained a good appreciation of the old city. Wimping out after the tour in 87° heat, we took the funicular to the castle. 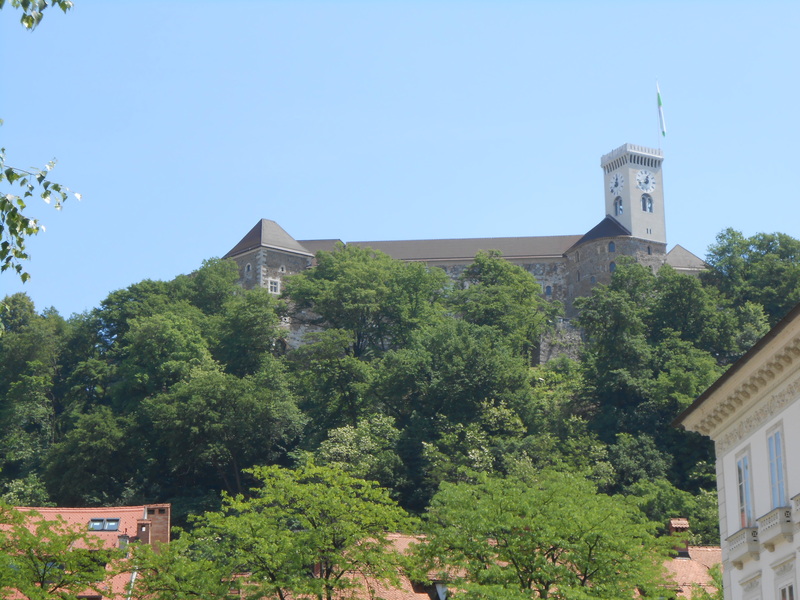 Architecturally, the castle is a cobbling together of different eras and some reconstruction, but still worth a visit, particularly to the watch tower and the Slovenia History Exhibition. The latter’s exhibits are excellent and formatted with a selection of submenus (with subtitles in several languages) that allows the viewer to learn as much or as little as desired. 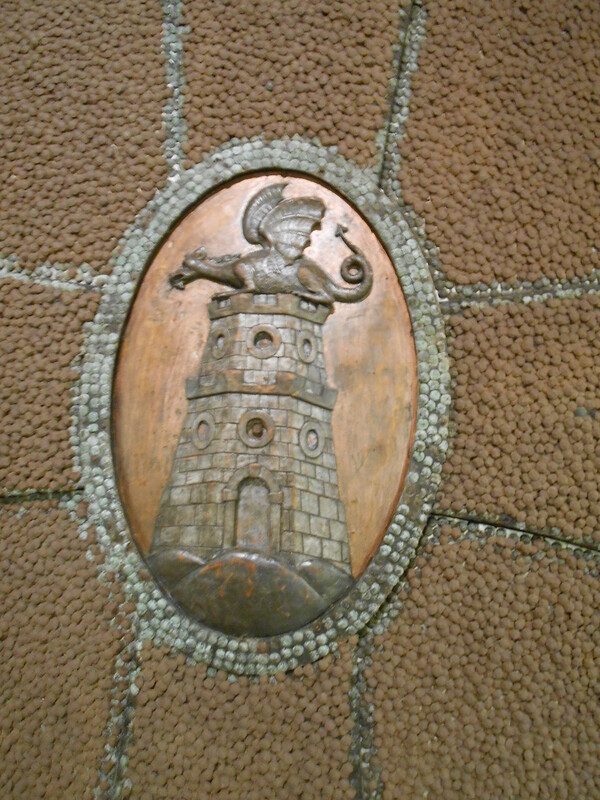 The only way up the watch tower is hoofing it, but the panoramic views of the city are worth the climb. The City Museum of Ljubljana turned out to be one of the best museums we’ve ever visited. The modest admission fee (student and senior discounts available) also includes a free audio tour in several languages. The museum covers the history of Ljubljana, and, of course, Slovenia, from pre-Roman to contemporary times. With each exhibit in this three-level museum, the audio guide allows the visitor to select more in-depth background if desired, as well as skip entries if you’re enough of a philistine to blow off a fascinating history. 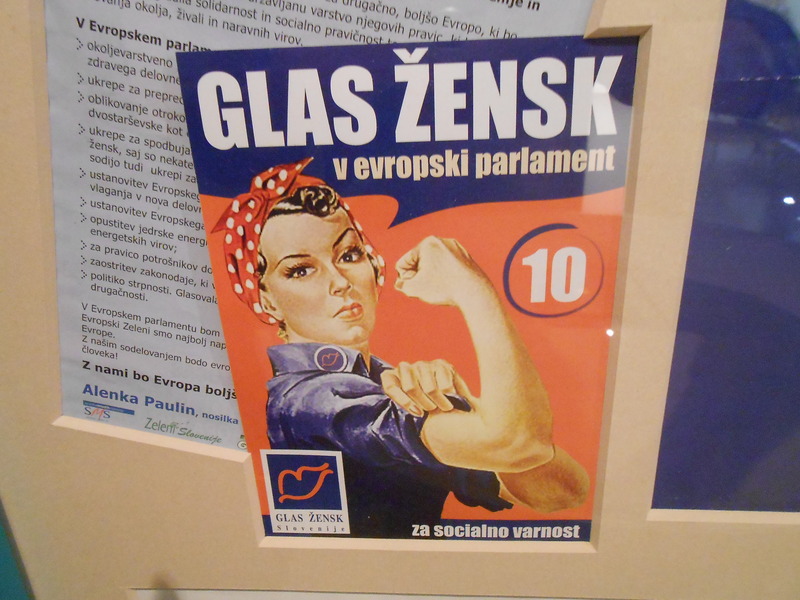 Rosie, the riveter, a symbol of Slovenian women’s power movement. I noted that it was identical to the WWII poster of Rosie the Riveter, encouraging and praising women who went to work in America’s factories, replacing the men who went to war and maintaining the materiel output that helped the Allies win. A very nice girl at the front desk translated the Slovene caption I’d copied and explained that the “Rosie” image had been adopted by the post-WWII women’s rights movement in Slovenia. She added that women did not receive the right to vote until after WWII. How interesting and appropriate that “Rosie” became the Slovene feminist symbol! I’ll close this somewhat lengthy blog with notes on two great restaurants, Sokol and Most. Sokol was recommended to us for “typical” Slovenian food, and despite concerns that it could be a tourist trap, we went the first night. And the next. There was a wide range of Slovenian dishes on the menu in nature and prices, but all portions were generous and the food delicious and reasonable . Over two nights we had octopus salad, calamari stuffed with ham and cheese, traditional venison stew, chicken pate wrapped in prosciutto, and salads. The last night we ate at Most, where the sesame-encrusted tuna steak and gnocchi with grilled pears and a walnut cream sauce were out of this world. We highly recommend both. Sokol: Ciril Metadov trg 18, just east of the Town Hall and Robba Fountain. Most: Petkovskovo nabrezje 21, on the north side of Butcher’s Bridge, a block and a half east of Presernov Trg (Preseren Square). Two nights we hung out after dinner at Seam, an outdoor café on Presernov Square that offered live music. The first evening was forgettable rock and roll, while the second evening featured a guitar duo that played a great assortment of “soft” rock from Elvis to U2, and everything in between. Even when the music wasn’t great, the atmosphere was congenial, the river and city beautiful, a very nice end to both evenings. For whatever reason, train travel between Trieste and Ljubljana is unnecessarily complicated, at best; in the train station at Trieste, we were told outright it wasn’t possible, and the bus was recommended. Whatever the train situation is, I’m happy to report that the bus was a comfortable and inexpensive alternative, about €26 for an air-conditioned, 2 ½ hour ride. However, there are no toilet facilities on the bus, so keep that in mind. 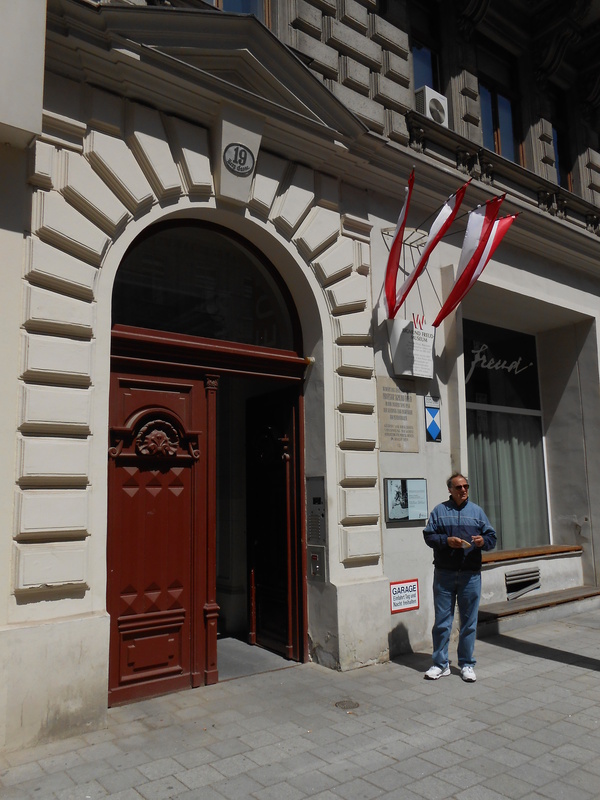 We stayed at the Central Hotel which was about 3 blocks north of Presernov Square. The room was not large but spacious enough, with a great shower, and the included breakfast was great. The reception staff all spoke excellent English, as did almost everyone we encountered in Ljubljana. All in all, an excellent start to our first visit to Slovenia! Piazza dell’Unita d’Italia, Trieste. The city claims this to be the largest sea-side plaza in Europe. Bordered by mostly government buildings, broad pedestrian-only side streets are lined with outdoor cafés where hundreds of locals gather for pre-dinner drinks. 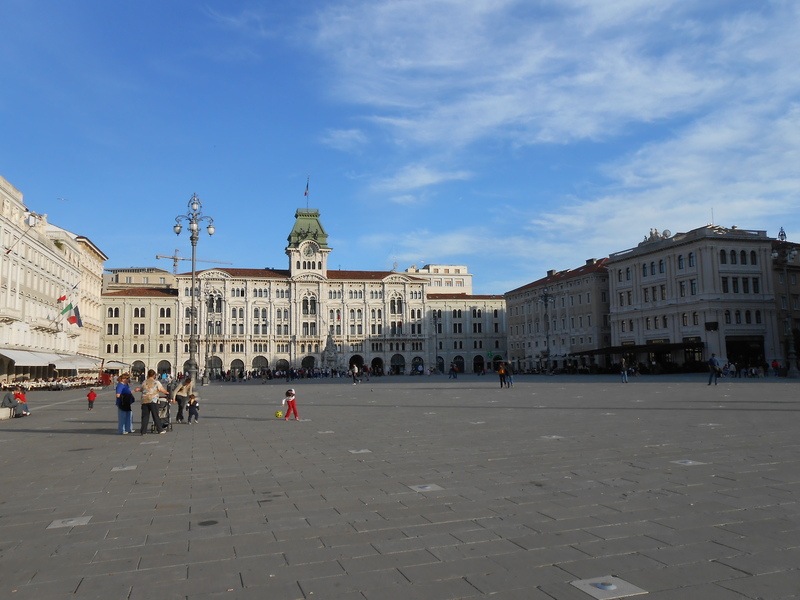 Never having been to Trieste, Michael and I chose to make this northeastern Italian city our jumping off point to traveling in Eastern Europe. 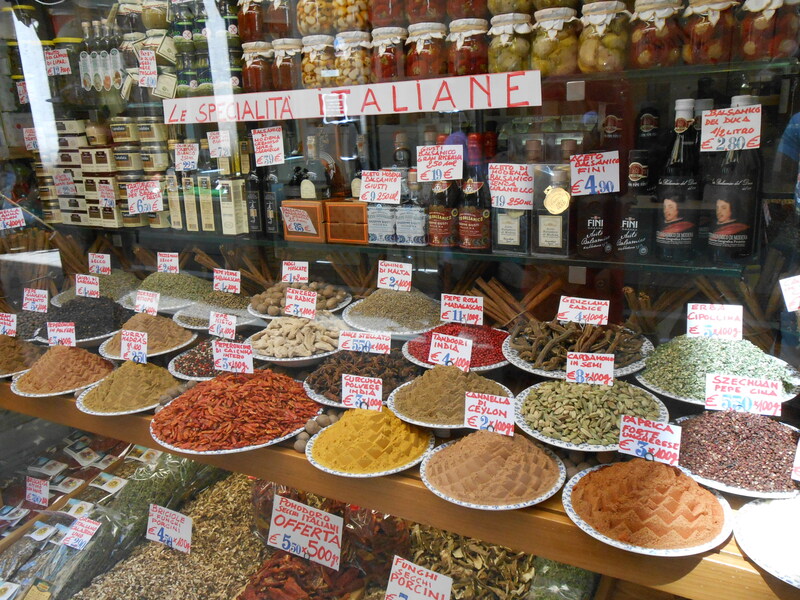 A short 2 ½ hour train ride from Venice, Trieste is so different a city in every aspect. For starters, Trieste has not been part of Italy for the majority of its existence, and I’m talking centuries. For over five hundred years Trieste was part of the mighty Austro-Hungarian Empire until 1918. 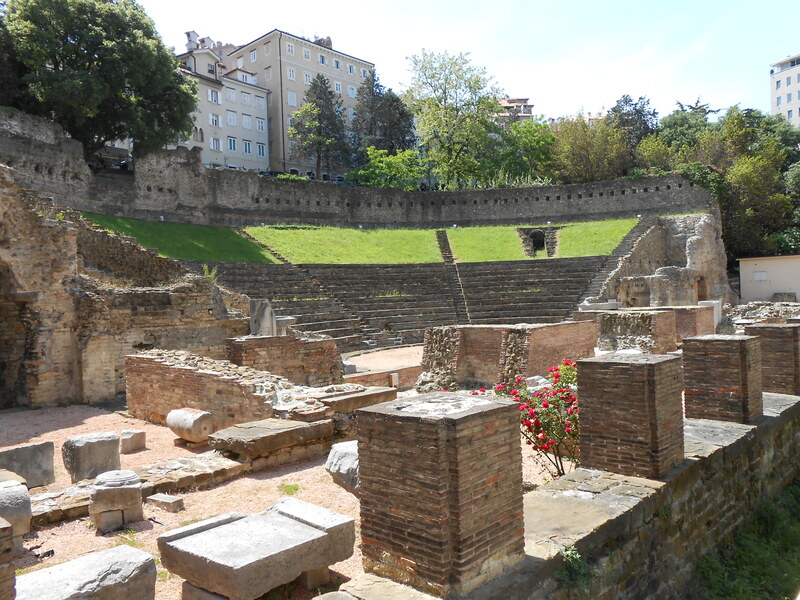 But in the 20th century alone, the city changed national hands several times, first going from being the Hapsburg’s major seaport to being annexed by Italy after WWI. During the latter years of WWII it was occupied first by German troops, then, briefly, by Yugoslav partisans. Post-war Trieste was declared an independent city-state but remained under a UN-authorized, joint British-American protectorate until 1954. At that point, the Trieste region was divided in half, with the northern sector, including the city, going to Italy and the south to (then) Yugoslavia. To this day, Italian is only one of the “official” languages, although now the most commonly spoken in the city, but with Slovene, Croatian and German competing in usage, the first two, especially, in the countryside. Another feature we noticed immediately was the lack of tourists, even in the main square, Piazza dell’Unita d’Italia (above). Certainly, May is before the height of the tourist season, but in wandering through many popular sites we saw few tourists. For sure, we were the only Americans within earshot. Moreover, when we were asked our origins, natives were surprised that we were American. I’m not sure that their surprise was because there’s a singular lack of American tourists in Trieste or whether we just didn’t meet their image of what Americans are like as people or tourists. Being us, we arrived at our dubiously three-star hotel, duffle bags in tow, looking like aging ‘60s hippies out of a time travel warp. Maybe it’s no surprise the Triestians were surprised! In all, we liked Trieste and found parts of it quite interesting. 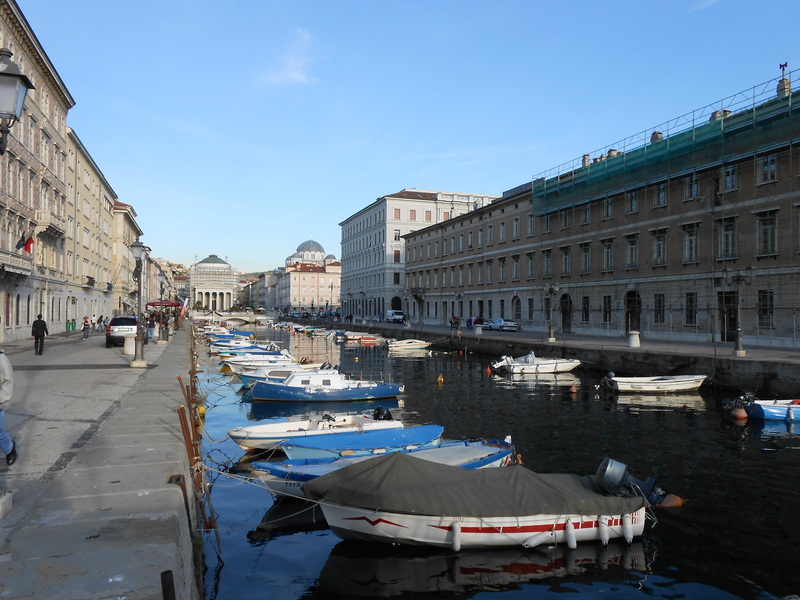 We did some typically touristy things, as well as just hang out spritzing with the locals during the pre-prandial hour(s) along Trieste’s own Canal Grande. 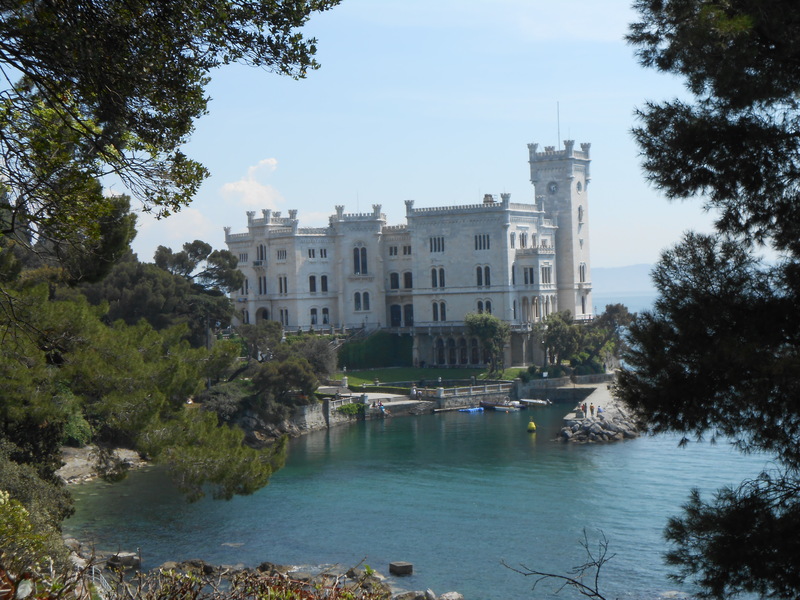 Without a doubt, our visit to this delightful little castle 9 km north of Trieste was the highlight of our stay here. 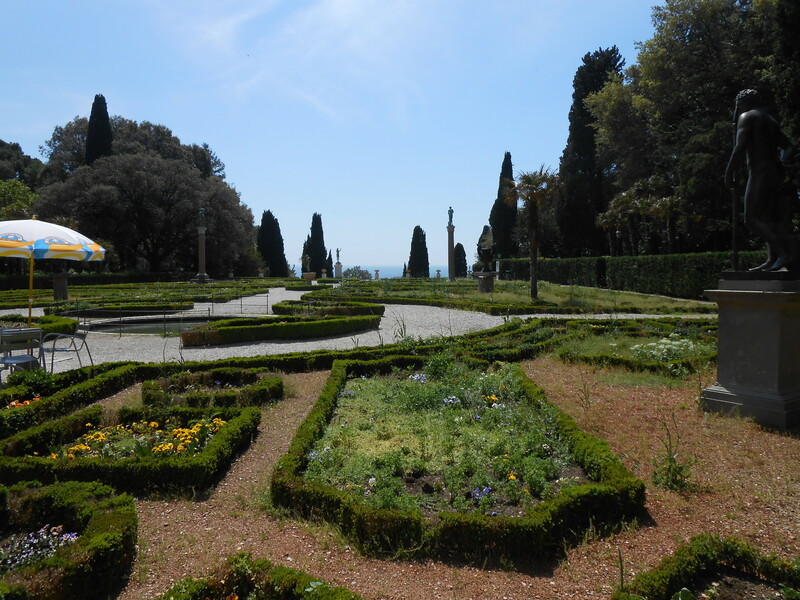 We caught a local bus from Trieste to the plaza at the foot of the castle, then walked about a half mile up the hill and through the impressive gardens and shaded footpaths to Miramare. Luckily, we arrived between two large tour groups and had the castle pretty much to ourselves. We shelled out extra Euros for the audio tour, which was well worth it. Miramare was designed and built 150 years ago by the Archduke Maximilian of the Austro-Hungarian Empire as his Adriatic vacation home. The castle is beautifully decorated with immaculate attention to details in both construction and interior design. Much of the interior reflects a nautical theme, a nod to Maximilian’s tenure as first an officer, then commander-in-chief of the Hapsburg navy. Other rooms display baroque and Oriental themes, all beautifully appointed. Maximilian was the younger brother of the emperor of Austria-Hungary, Franz Joseph, a rather enlightened and long-reigning ruler for his time. Maximilian was not quite as fortunate. Cultured, educated, and somewhat a progressive, reform-minded idealist, Maximilian succumbed to the persuasions Mexican monarchists and Napoleon III of France and accepted the throne of Emperor of Mexico in 1863. His was a short-lived reign. Despite efforts of both Maximilian and his wife to bring reforms to and relieve the stunning poverty of much of the Mexican populace, the country dissolved into revolution in the mid-1860s. Captured by revolutionary forces, Maximilian was executed by a firing squad in 1867 at the age of 34, despite international pleas for clemency. His wife, Princess Charlotte of Belgium, suffered a massive nervous collapse from which she never recovered, despite outliving her husband another 60 years. As short and tragic as his life came to be, Maximilian’s legacy shines on through his brilliant, beautiful creation, Miramare. It is truly a jewel not to be missed. The interior of the castle is mostly off-limits, although it does offer a small lapidary museum which was quite interesting. The battlements offer a panoramic view of the port and city, as well as open-air seating and a small cafe. We spent a pleasant hour eating a picnic lunch and enjoying the sun and view. 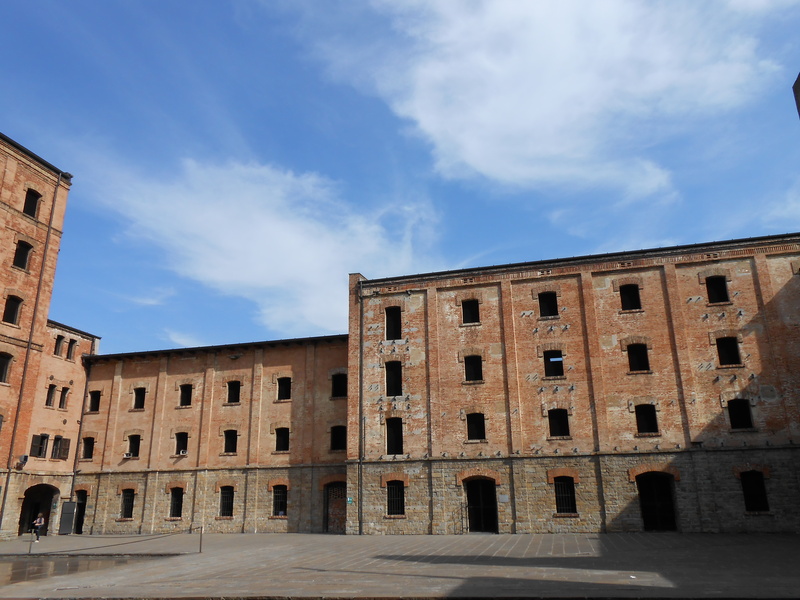 Museo de Risiera di San Sabba. 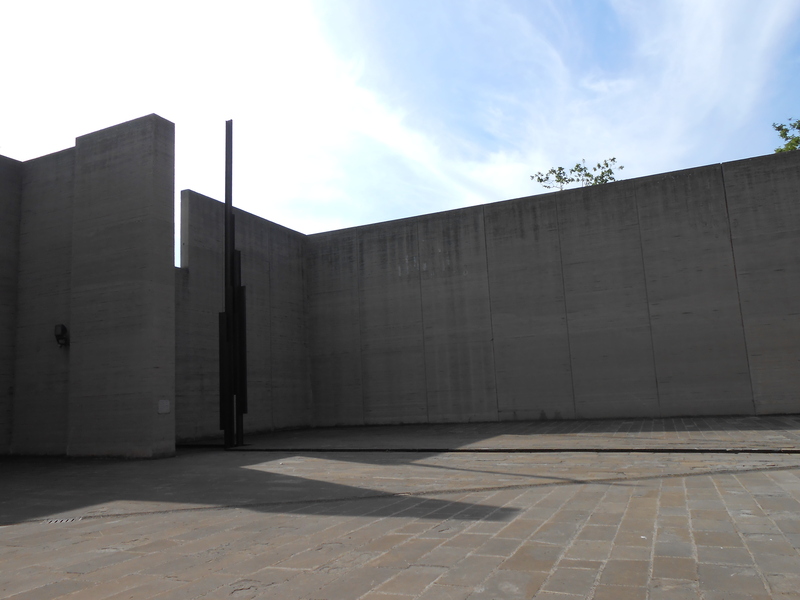 A more somber side trip was to the Museo de Risieria di San Sabba south of Trieste. A former rice-husking plant, the facility was converted in WWII by German occupying forces into first a POW camp, then a deportation camp and crematorium — the only extermination camp in Italy. 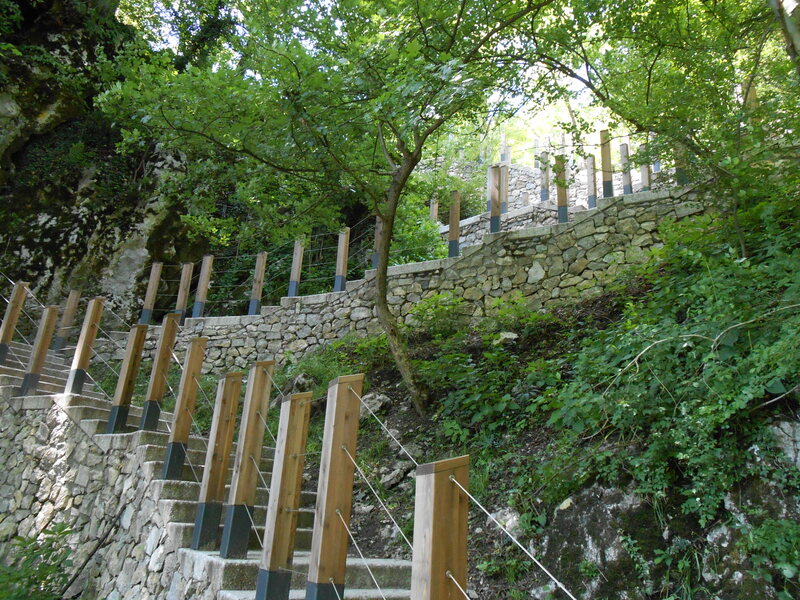 Thousands of prisoners were executed at Risiera, including 5,000 of Trieste’s 6,000 Jews. The bulk of the approximately 10-15,000 killed during the single year the crematorium was in operation were primarily Slovene, and some Italian, partisan fighters or sympathizers. 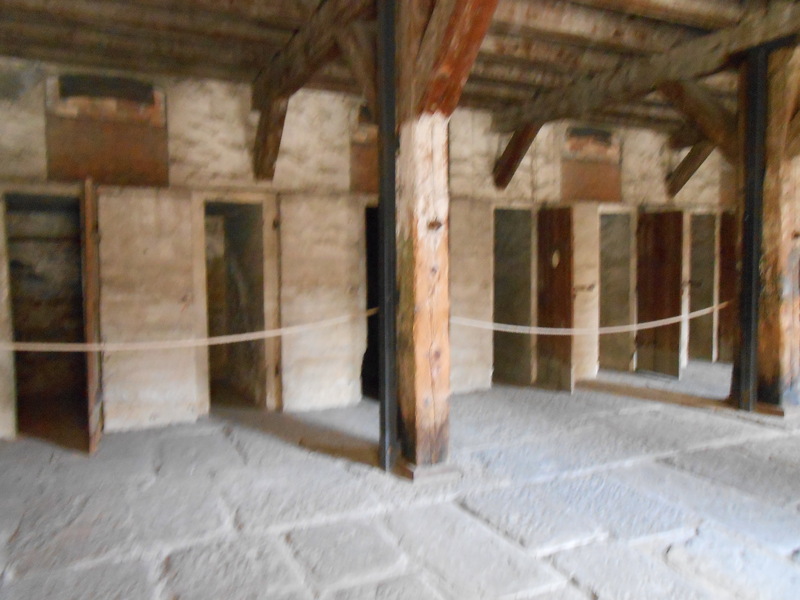 The torture and holding cells at the prison. At the end of April, 1945, the Germans torched the crematorium and several other buildings as the troops fled before the advancing Allied forces. In 1965, the entire site was declared a national museum. Where the crematorium and human warehouse once stood, a metal sculpture now reaches for the sky, symbolizing the smokestack and rising human ashes and smoke of a horrific past. The Trieste bus system is efficient and inexpensive. A single ticket allowing bus travel for 60 minutes costs €1,10. Tickets are most easily purchased at a tabacchi or newsstand. If you are going to either Miramare or Risiera, you will need two tickets per person, one for the trip out, the second for the return. Upon boarding the bus, you punch your ticket in the little yellow machines stationed throughout the bus. It seemed the tickets were rarely checked, but if caught cheating, you will be the embarrassed recipient of a hefty fine. Bus # 24 goes to San Giusto Church and Castello. 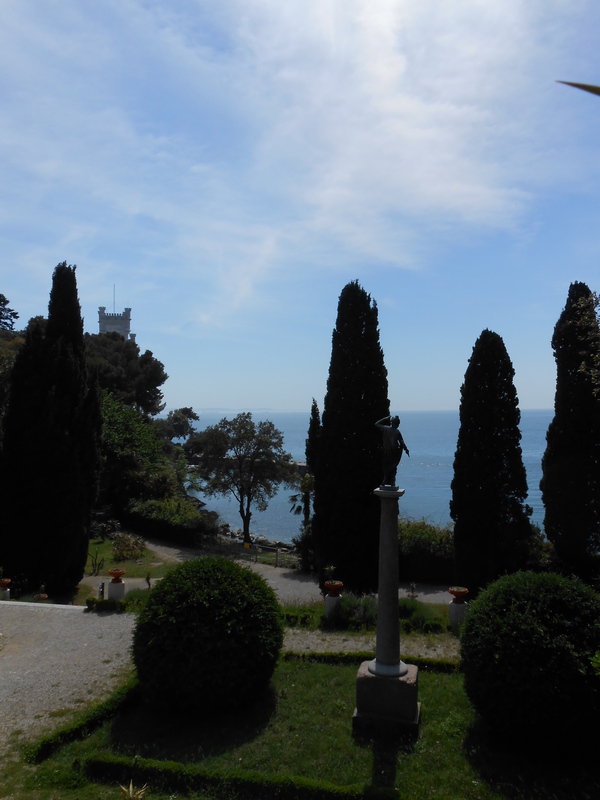 Bus #36 goes to Miramare; get off at the last stop and walk up the hill through the gardens to the castle. Bus #8 drops you about two blocks from the Museo Riseria. Go south about 1 ½ blocks, turn left and the museum entrance is a ½ block further on the right. 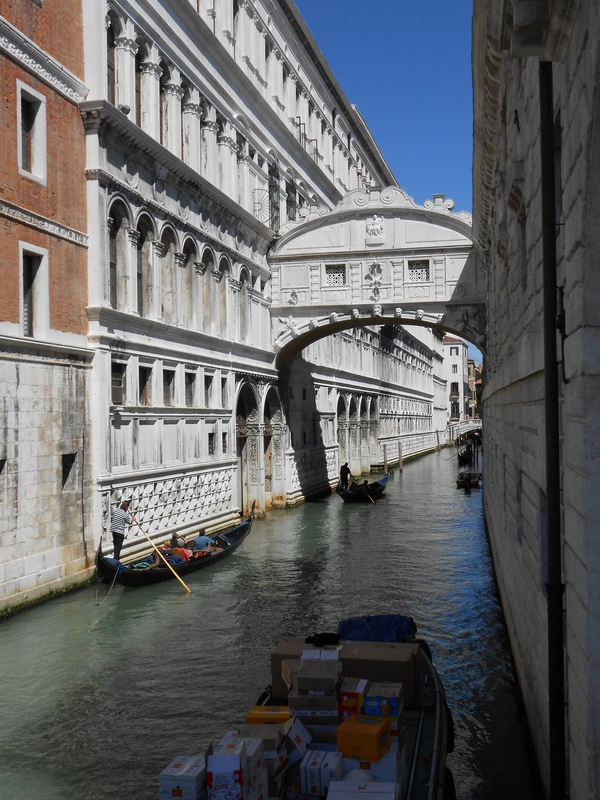 On a whim, Michael and I took a two-hour walking tour which promised to show us “hidden Venice.” In a paraphrase of an old axiom, we waited for the guide at the top of the Rialto Bridge with high aspirations but low expectations. Boy, were we wrong, and never have I been so glad to BE wrong. The tour was informative and fascinating. Our guide not only knew her art, history and city, but dished up an abundance of facts and sights without once losing our interest. From historical facts to artistic details to recipes for different “spritz”, the Italian version of a spritzer, we had a packed two hours roaming the San Paolo and San Cassiano sectors of Venice. Below is just a few samplings from the tour. 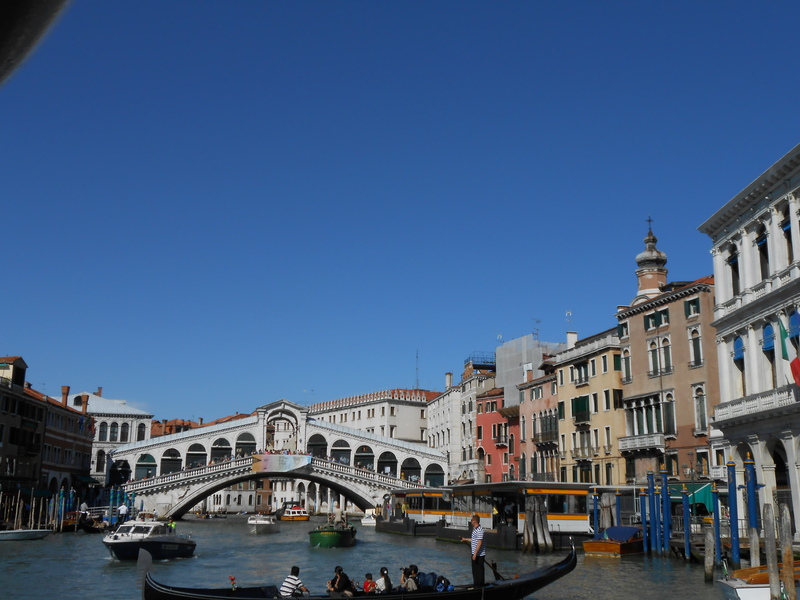 The Rialto Bridge was the first permanent bridge built over the Grand Canal. The Rialto itself has been the heart of Venice for centuries, boasting the city’s largest market, as well as the central banking and trading venue in Venice. The ancient market, still thriving today, is on the left side of the canal in the above picture. And that brings me to the subject of gondola vs. sandolo. Our guide pointed out the difference: the gondolas are higher-prowed, and larger, while the sandolos are smaller, lower, and flatter than their more elegant cousins. You can see the difference in the prows and lines in the above: the sandolo is in the foreground, with moored gondolas behind. Spice Street, as loosely translated from the Venetian dialect. From about 1000 to 1500 C.E., Venice was the mistress of the Mediterranean, effectively conducting and controlling sea trade between the Asian and Islamic worlds and Europe. Their control was hard-won and, at times, at great cost to this small republic. Yet, through their intrepid seamanship, shrewd negotiation and trade savvy, the Venetians managed to attain the pinnacle in the spice and silk and other trade for 500 years. Of course, many times Venice had to resort to warfare with its neighbors, primarily with arch rival Genoa, in order to maintain supremacy. Yet several times the Venetians also managed to take on — and beat — a somewhat (at times) united Europe, the Byzantine empire, and even a succession of popes. More than once a pope threatened excommunication, and at least twice excommunicated the entire city trying to reign in this unruly, independent-minded republic. It took two world-changing events in the 15th century to topple the mighty Venice: Columbus’ “discovery” of the New World and Vasco de Gama’s discovery of the sea route around Africa. Both forever changed the balance of both trade and power in Europe, and Venice never quite recovered its former position as a sea power. I won’t go further into further detail, but I will recommend a fascinating book that covers this period in Venice’s history: City of Fortune: How Venice Ruled the Seas, by Roger Crowley. 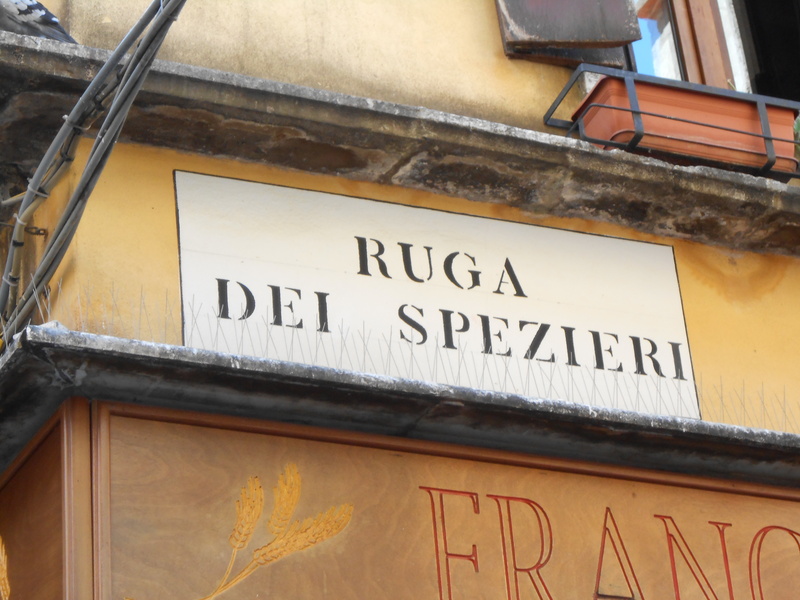 Sadly, the sole spice shop remaining on Ruga dei Spezieri is the one above. 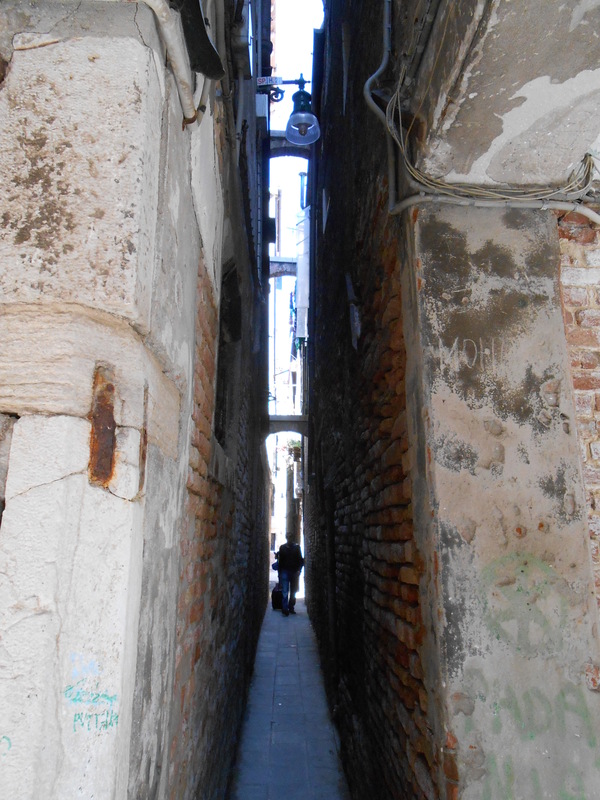 Unbelievably, this is not the most narrow street in Venice. But this is a residential street, with three or four doors leading from either side of the 2+ foot wide passageway to 3 and 4 story homes. This street should be in an advertisement for IKEA furniture, a good argument for furniture that must be assembled after the flat-packed boxes are delivered to the houses. Titian’s masterpiece, The Ascension of the Virgin Mary, Frari Church. http://europeforvisitors.com/venice/articles/venice-airport-transportation.htm Has lots of good links and info. Note: prices for water taxi have gone up considerably since this was published. http://www.tripadvisor.com/Travel-g187870-c2870/Venice:Italy:Airport.Transfer.With.Heavy.Suitcases.html Excellent article and up to date. The Trip Advisor site has excellent advice and links for transportation from Marco Polo Airport to Venice proper, especially useful when you have heavy or more than carry-on luggage. Walking a distance to your hotel with lots of luggage can be strenuous and awkward as you have to haul your bags over bridges and cobblestone streets. We didn’t feel like forking out 120 Euros to take the private water taxi (or the Alilaguna) so we took the ATVO Bus instead. It’s very convenient, just outside the international arrivals area. You can get your tickets on the bus or at the airport Tourist Info desk, which is also just outside the international arrivals. It’s 5 Euros per person one way, 9 round trip. The air-conditioned ATVO buses go about every 20-30 minutes to Piassele Roma, where you can either take the vapretto (public water bus) or if you’ve got lots of luggage AND your hotel has a water dock, then the water taxi might be the best option. If you are arriving by train at the main station, your options for getting to your hotel are easy: walk, take the vaparetto, or a private water taxi. 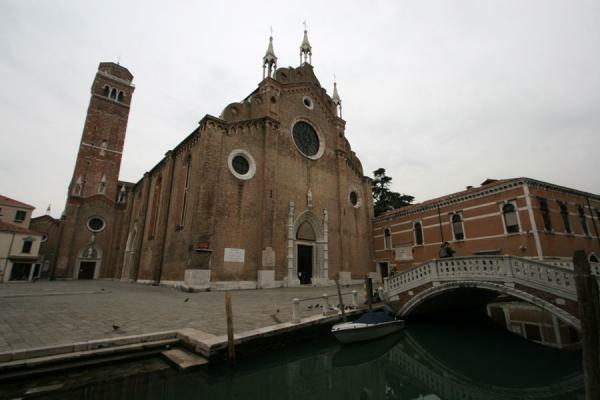 If you plan on doing a lot of sightseeing in the primary museums and churches, you should probably get a “Venice Card”. Go to www.hellovenezia.com and check it out. 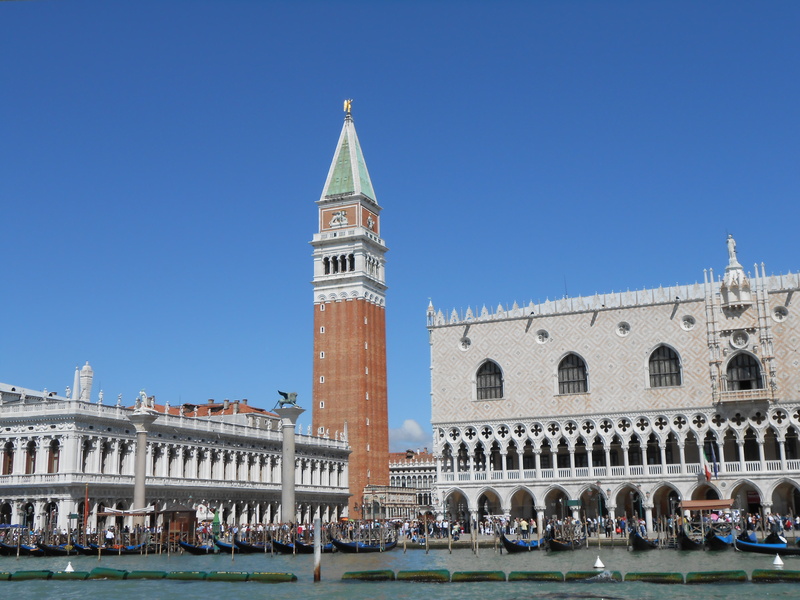 You can also reserve on line, for 1 euro, tickets for the San Marco Basilica and the Ducal Palace. You can also buy separately the “Museum Card” which gives discounts as the top museums but no churches, or the “Chorus Card” which in reverse, gives discounts to several churches but no museums. One thing to keep in mind is that none of the above cards provides any public transportation discounts. The options, essentially, from least to most expensive are walking, the public transport vaporetto or private water taxi. You will have to purchase your vaporetto tickets separately. They have various passes available, such as 1 day, 48 hour pass, and 7 day pass (and more). I suggest checking where your hotel is located, then decide what you want to see, and how much you want to walk versus taking the vaporetto, versus splurging for the very expensive private water taxi. Our first twenty-four hours in Europe have been spent in Venice, as beautiful and intriguing as it is multi-faceted and elegantly worn in places. Two items of note were immediately apparent to me: water in the canals and lagoon was the cleanest I’d ever seen (or smelled), and, major strides in public works. Everywhere we went, on canals and land, many buildings both grand and small had been repaired and shorn up or were under repair. One thing that had not changed was to arrive in Italy with our luggage MIA. This is now two out of three times we’ve arrived in Italy by air sans baggage. All the other trips have been by train or car, with ne’er a mishap in the baggage department. Unlike the last time, our luggage was delivered before 24 hours was out. Four years ago we’d learned how such fun it was to arrive in Italy after an African safari and live out of carry-on bags for 5 days. Back to Venice. As this was not our first time here, we chose to catch a few of the de rigeur sights previously unseen, then focus on lesser-known places we’d not yet seen. But first: a balmy first evening was spent elbowing our way through the crowds at the Piazza San Marco where we succumbed to blatant tourism and enjoyed a glass of wine while people-watching on the piazza. Despite the crowds, it was delightful. The Basilica of San Marco, with flags in the foreground. San Marco is the patron saint of Venice. The three flags from left to right represent: the European Union, Italy, and the red and gold lion of Venice. An interesting legend about the Torre dell’Orologio (clock tower) is an illustration in how the best laid plans of mice and Venetians can lead a city to shoot itself collectively in the foot. Built in 1497, this elegant gold-leaf clock was a unique feat of engineering for its time. In order to prevent the secrets of its mechanisms from subterfuge, the inventors of the clock were assassinated to prevent rival cities of learning its secrets. Unfortunately, the clock’s mechanisms broke down, and the bells rang at random hours forever until finally repaired in recent times. 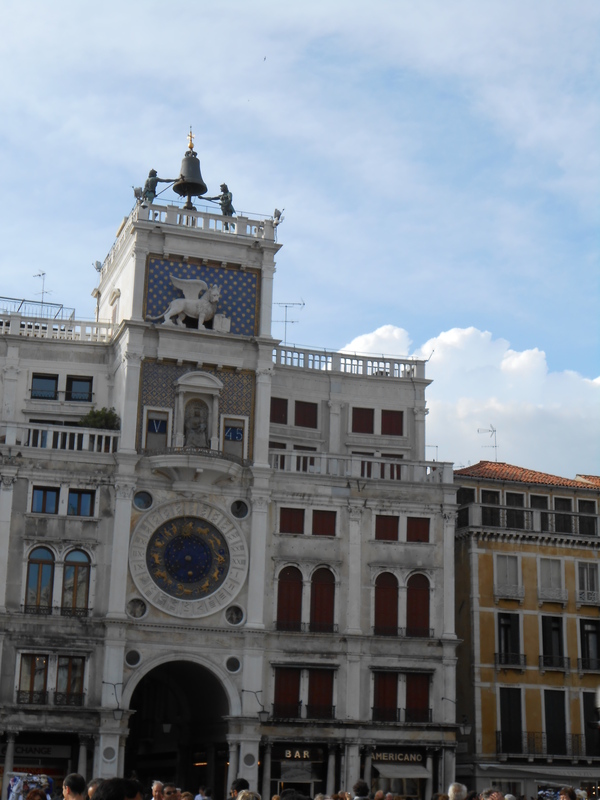 The next day we toured the Palazzo Ducal (Ducal Palace), also located on the Piazza San Marco. Somehow, we’d managed to miss this Venetian chestnut the first few times. It is well worth the lines, especially if you’re a lover of the painter Veronese, who seems to have illustrate many of the ceiling frescoes in the palace. Guidebook can fill in the palatial details; I’ll only make a few comments. Tired of the crowds, we hopped a vaporetto (water bus) to Lido, the barrier island east of Venice that serves as both a suburb and beach town for Venetians. The Lido was quiet, with absolutely no crowds, and beautiful beaches on the Adriatic side of the island. 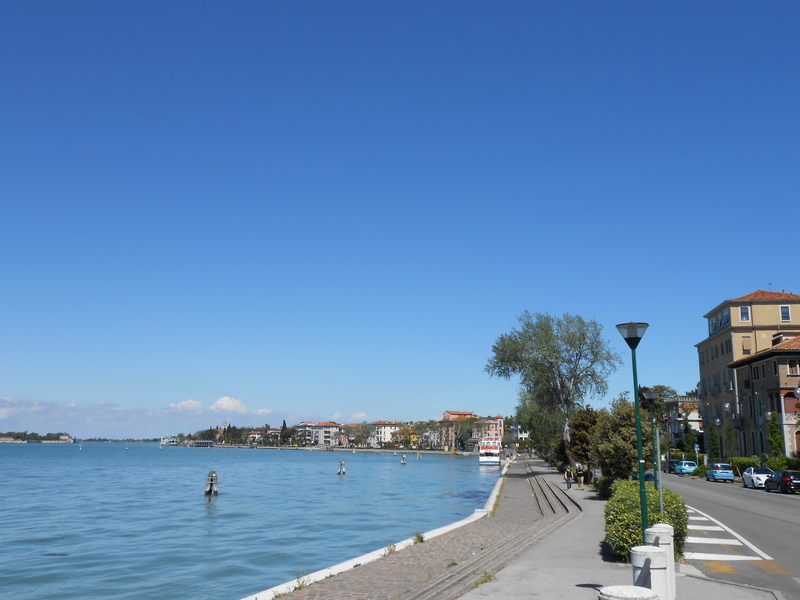 Lido island’s boardwalk and main street — so close to Venice but deserted in mid-day. We were enjoying a peaceful post-prandial stroll along the quay when Michael exclaimed, “What is that! Will you look at the size of that thing!” I returned with a puzzled, “What?” and Michael said, awe-stricken, “It’s a giant cruise ship. 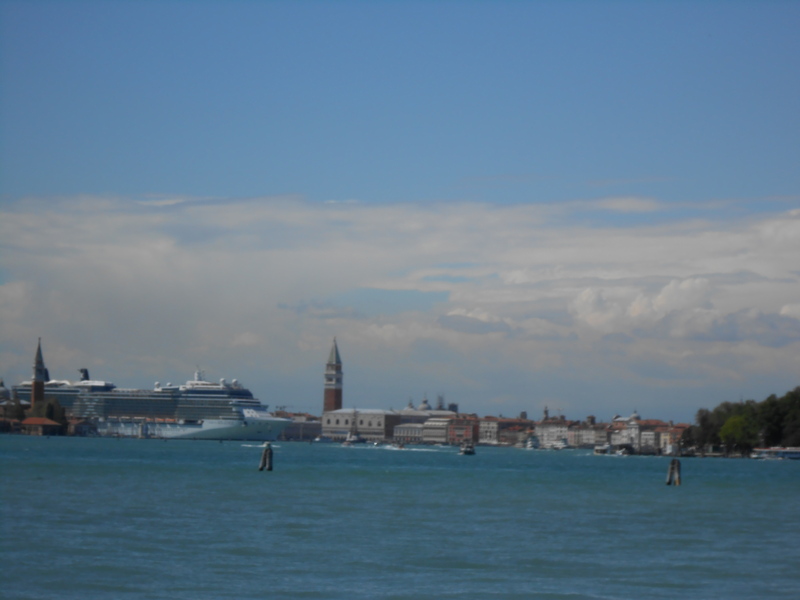 It looks like it’s going to swallow Venice whole.” And for the next ten minutes we watched with amazement as this humongous behemoth, the Celebrity Solstice, cruised down the canal between Guidecca and Venice, indeed looming over the city like a monster swallowing a fish. The giant “fish” that swallowed Venice. Looks like a ’70s Japanese monster film! Our hotel, the San Cassiano, could not have been better situated. A 14th century mansion, this “Residenza d’Epoca” (subtitle #1) served as the home of various Venetian nobility, according to its brochure. In the 19th century the painter Giacomo Favretto lived in the mansion, giving it the name “Ca’ Favretto” (subtitle #2). From the hotel’s balcony and private pier, we could sip a glass of wine at sunset while overlooking the Ca D’Oro on the other side of the Grand Canal. Except for the three-line name, a very nice hotel indeed. Hotel San Cassiano (etc.) is the reddish building in the middle of the picture. I will end with a humorous if embarrassing story. 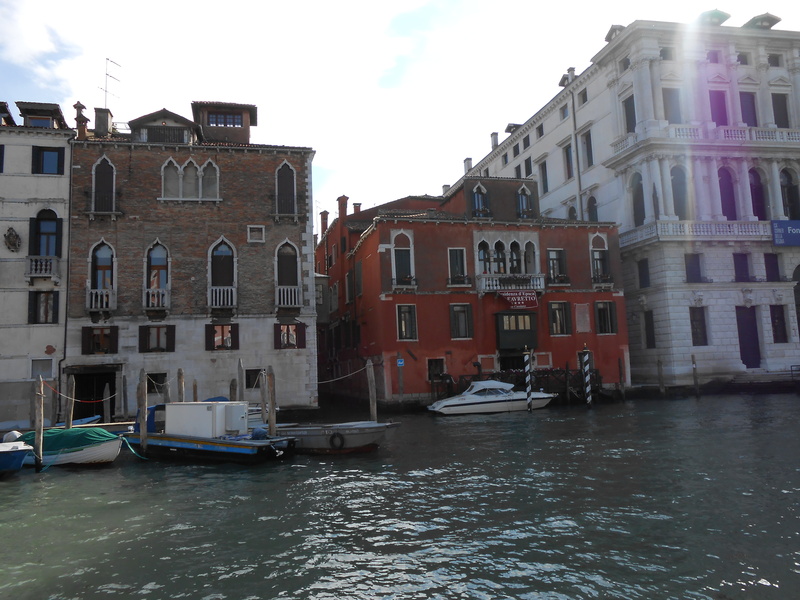 The first morning after arriving in Venice, Michael and I boarded a crowded vaporetto headed for San Marco. The conductor allowed far too many people on board, and as I felt the press of people from behind, the boat lurched away from the dock. I clutched Michael’s arm and hung on for dear life so I wouldn’t stumble in the press. As I continued to cling to his arm, I saw this woman in front of me starting to giggle uncontrollably, cutting her eyes up at Michael. As I tried to figure out what was going on here, Michael’s face – behind the woman – came into focus. Horrified, I looked up to see I’d been clutching to my side the arm of a total stranger, the boyfriend of the giggling young woman, a man about the same height and build as Michael, wearing a dark windbreaker. Horrified, I dropped his arm and started apologizing profusely (more like babbling in embarrassment). They were both great sports about the incident, the woman insisting repeatedly, “No, no don’t apologize, it was so cute!” Michael, needless to say, never let me hear the end of it!